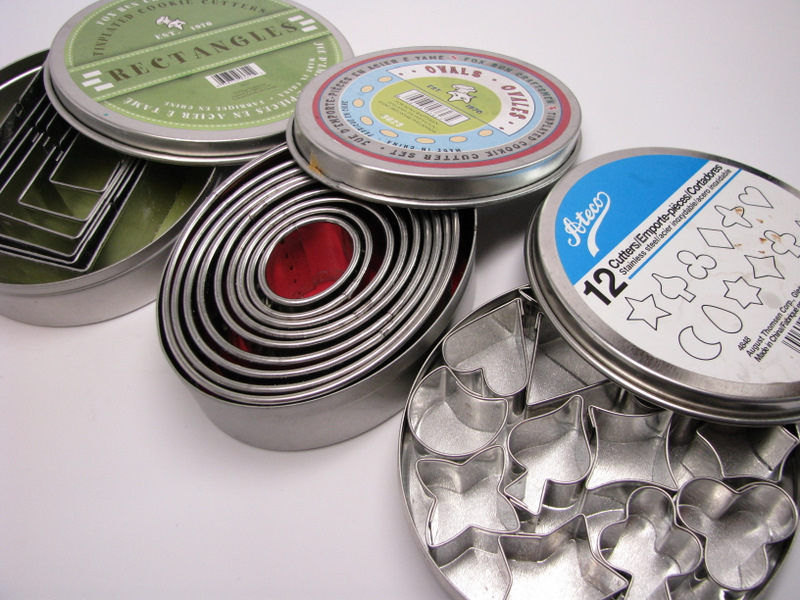 The rectangle set, oval set, and the medium aspic cutter set. I have recently seen the light about the awesome versatility of the basic cutter shapes. 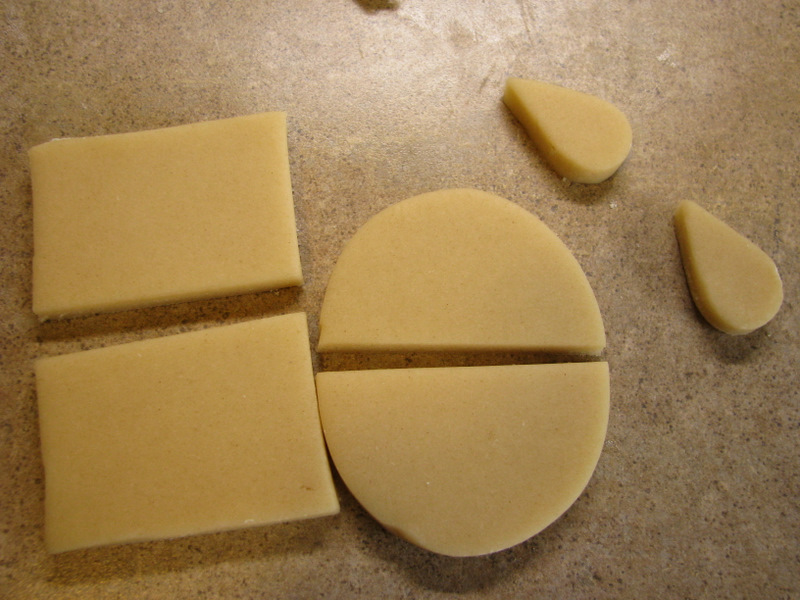 Sometimes there just isn’t the “perfect” cutter shape, and you have to do a little doctoring. So for for each pair of Indians, I cut one oval, one rectangle, and two teardrops. Cut the oval and the rectangle in half. 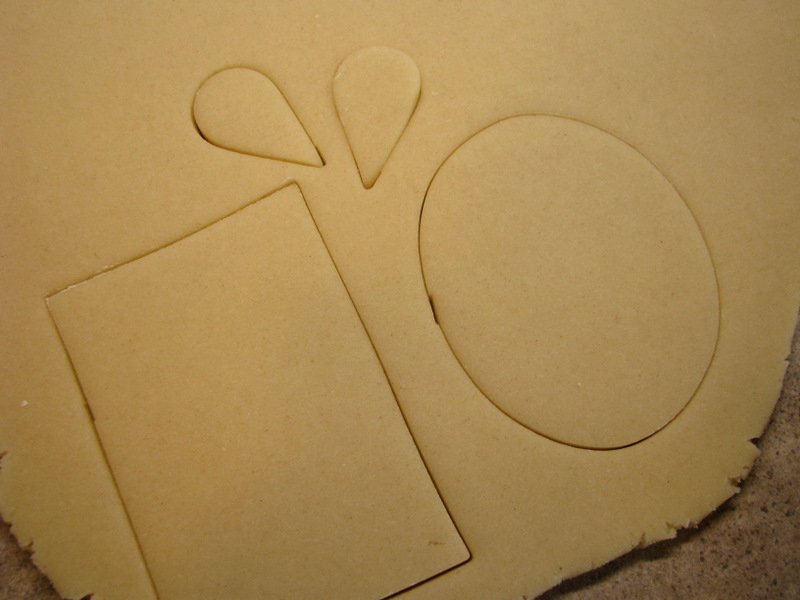 Cut a little bit from the teardrop using the oval cutter. Then put all your pieces together like a puzzle. 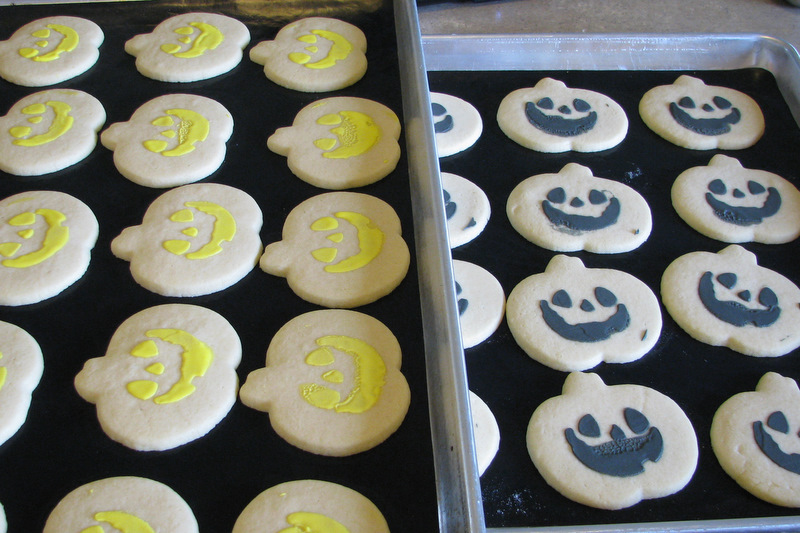 Then bake and decorate. 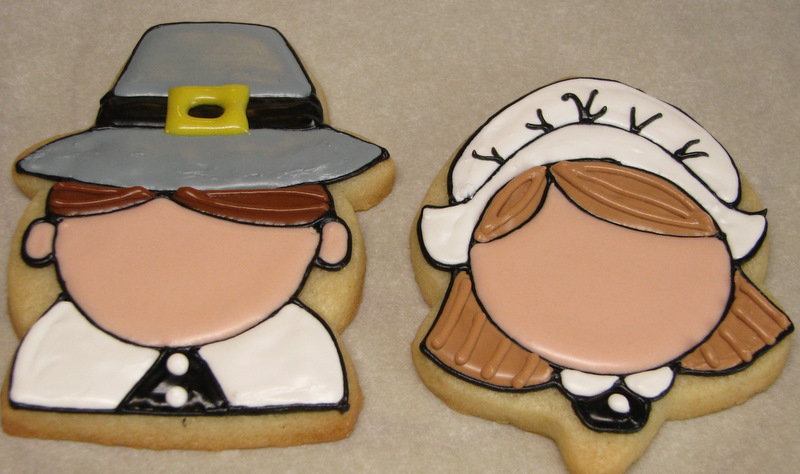 I didn’t do a step-by-step tutorial on the decorating, but it was similar to the pilgrims. 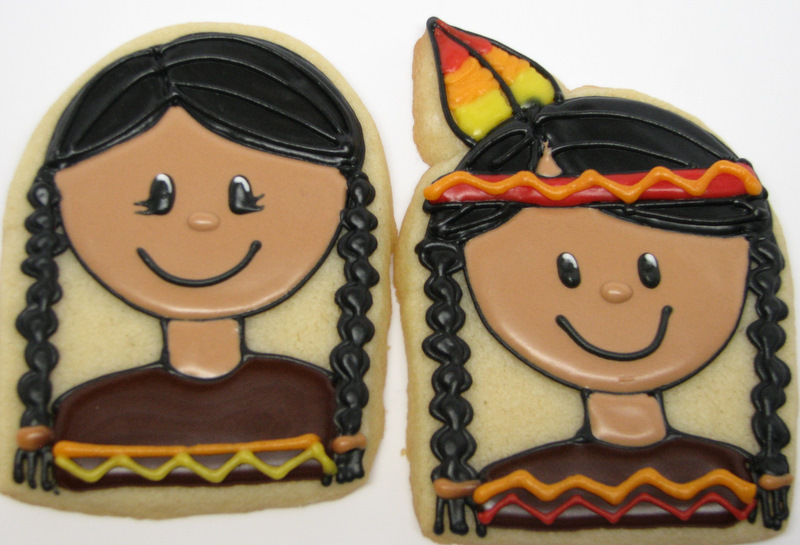 I used a 1 1/2″ circle cutter as a template for their heads, then drew on the hair, neck, shoulders and feather. 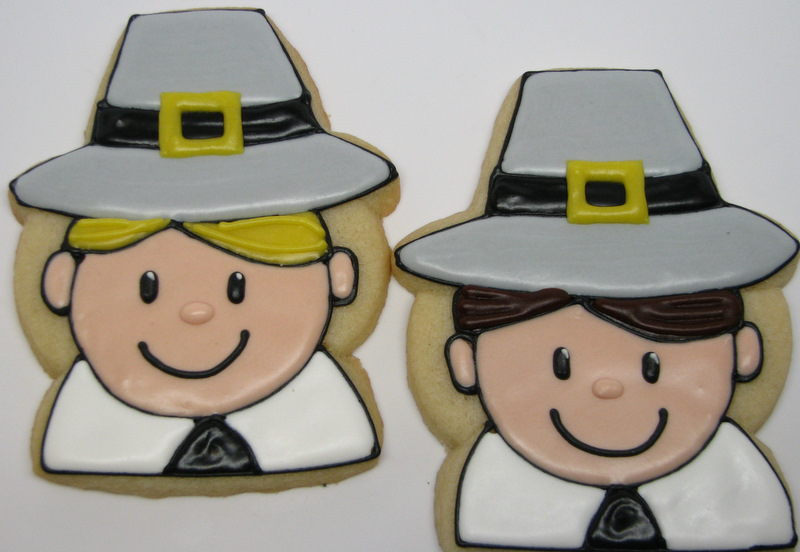 I did the faces just like I did on the pilgrims. AND a cool set of heart cutters that I don’t have a picture of because they’re not even in my store yet. But you’ll like them. That’s a lot of cookie cutters! Just comment on this post by Friday, November 18 at midnight (wherever you are! ), and I’ll choose one winner using Random.org to win all 9 sets of cutters. Please enter only once. Good luck! 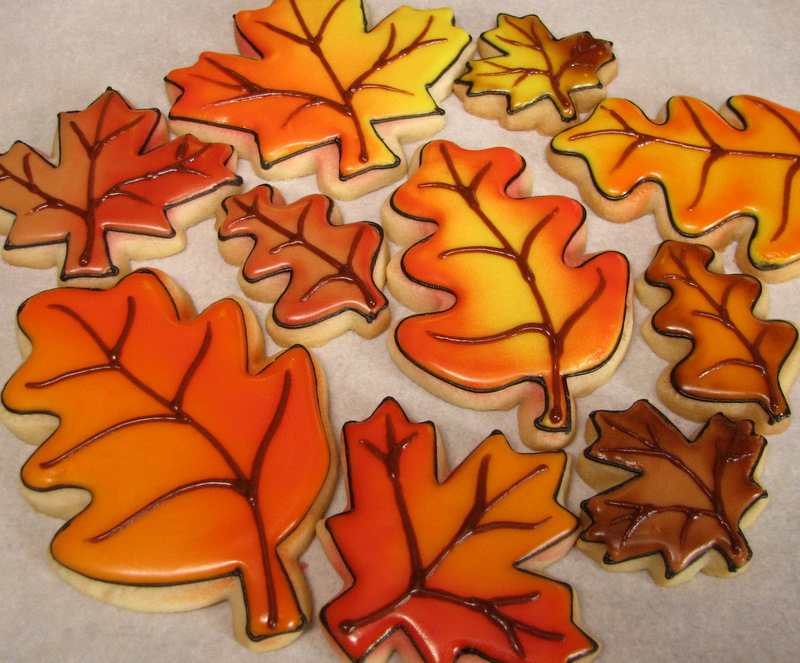 Thanksgiving is just over a week away, and I have a few more cookies to show you so that you can get decorating! 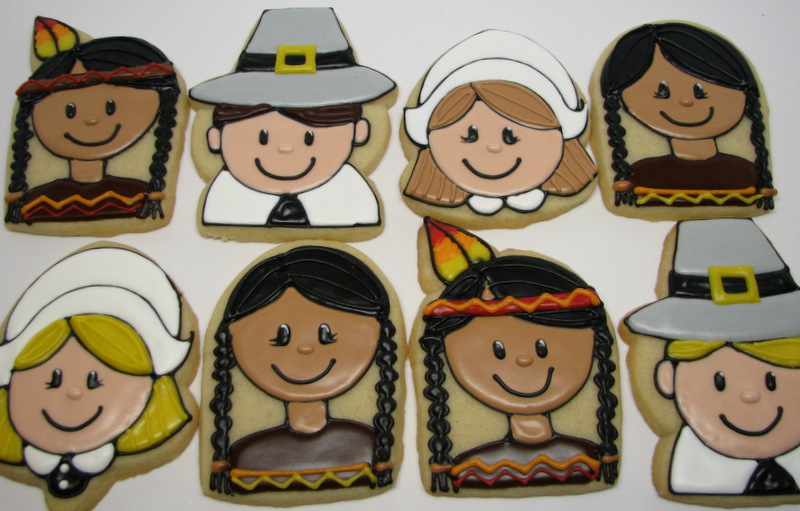 What would Thanksgiving be without Pilgrims and Indians? I’m going to show you how to do the pilgrims. For a great Indian tutorial, go check out Sugarbelle’s blog today! 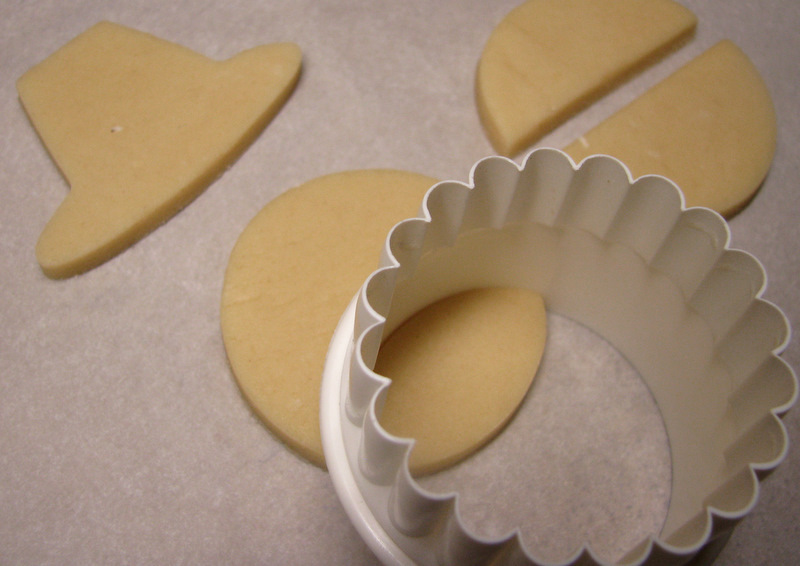 It’s hard to find cute people cookie cutters. 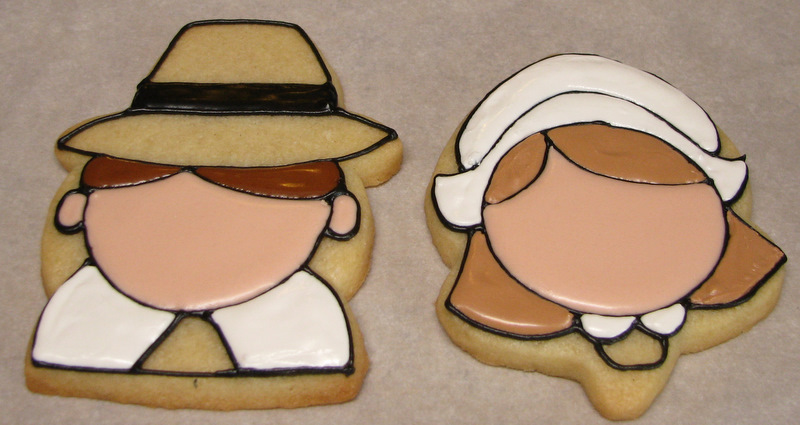 I wanted to do some pilgrims, but couldn’t find a cutter that would work. 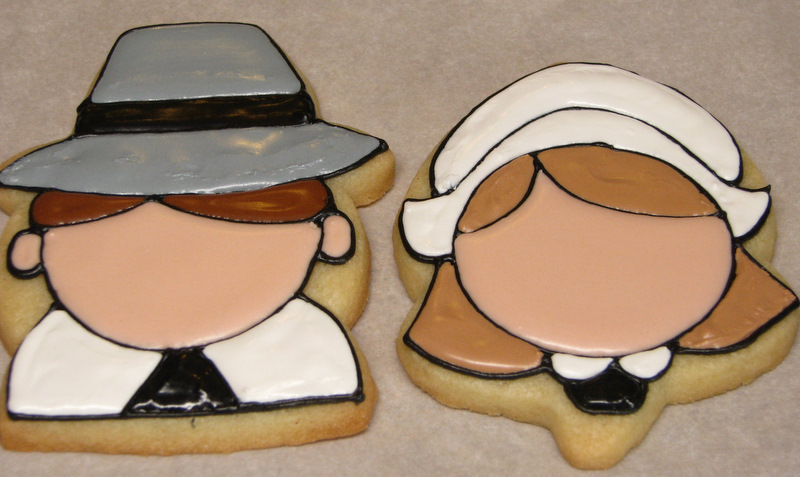 I had an idea of how to piece together a pilgrim boy (I’ll show you that in a minute), but I had no idea how to do a pilgrim girl. 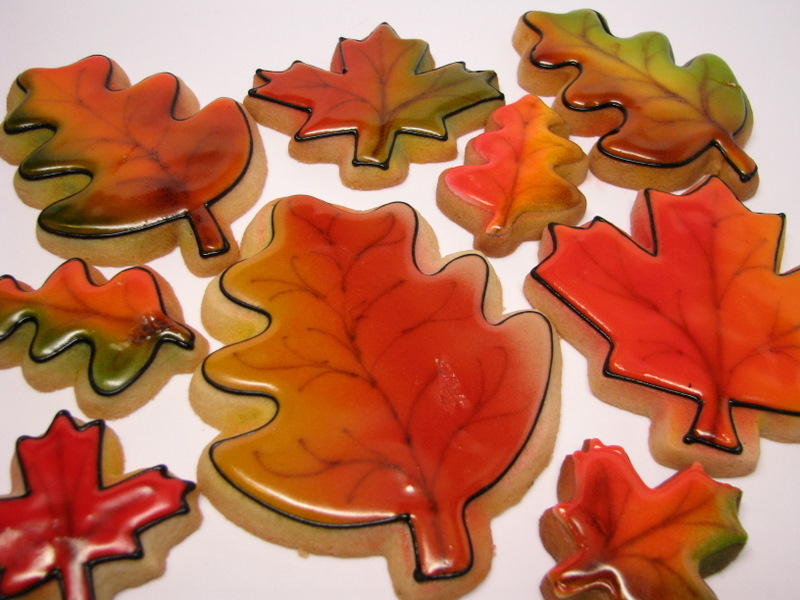 So I was baking some cookies for my Leaves and Acorns post, and I used the Wilton Leaves and Acorns cutter set. I was cutting out the cookies, and I got to the largest acorn. I thought, “Who needs an acorn this big?? Acorns are small!” But I baked one anyway because I wanted one of each size. 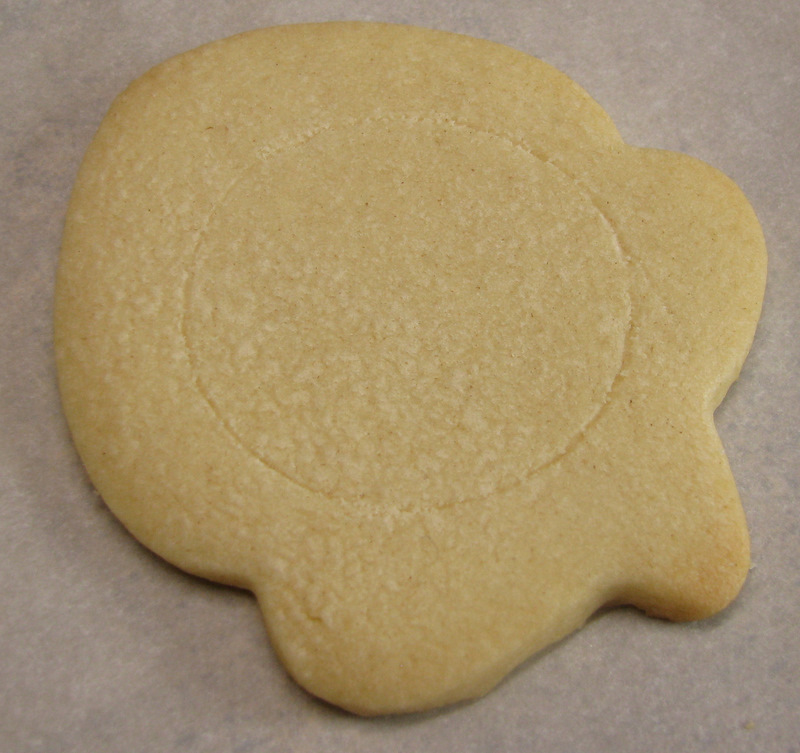 As I was pulling the tray of cookies out of the oven, the large acorn was up-side down, and I had an Oprah “aha” moment. I thought it might just make a cute girl pilgrim. On one of these, I cut off the “stem” of the acorn, and the other I left it on. You can decide which way you like it best when you’re doing it. Here’s how you make her. 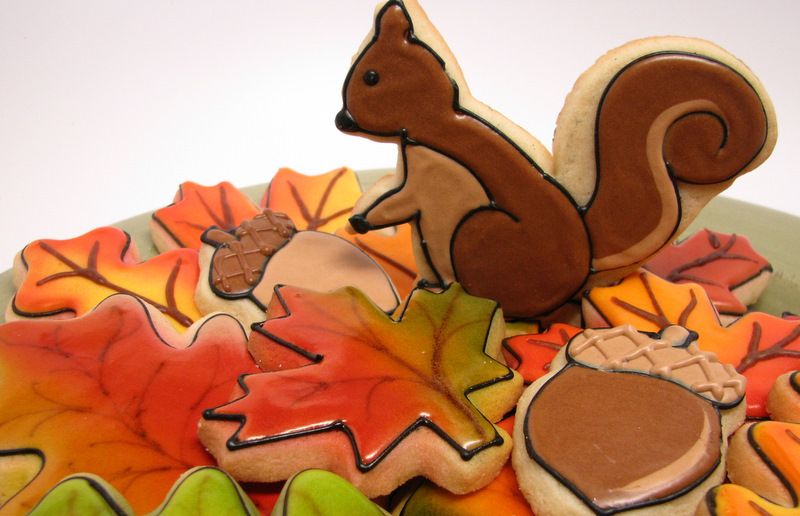 Bake some large acorn cookies. Let ’em cool. Unless you’re awesome at free-handing circles, find a circle template to trace around. I used the smallest circle from the Nylon Circle set, which happens to be 1 1/2 inches in diameter. 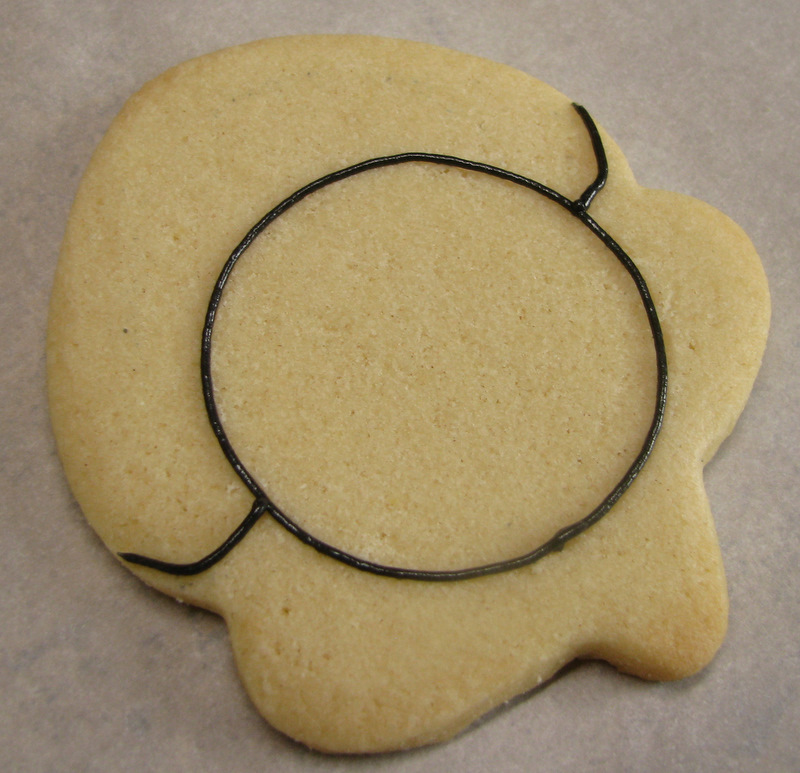 Use a boo-boo stick (or some other sharp object) to trace around it on your cookie. 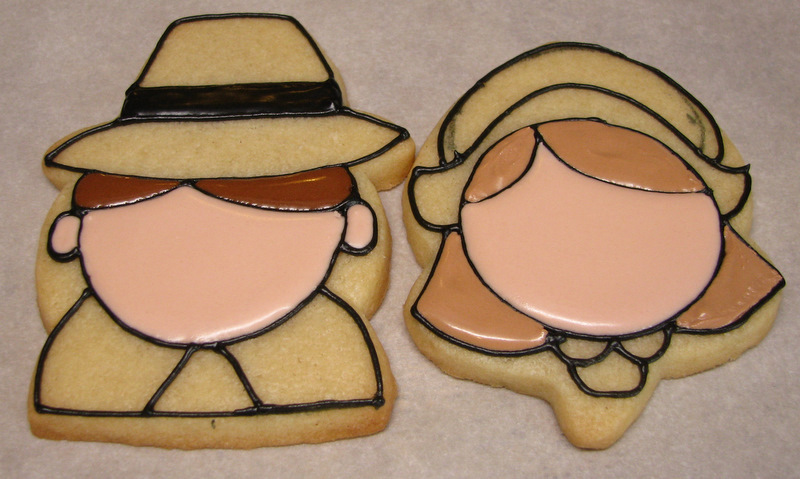 Brush off the crumbs, and you’ll be left with a nice outline to follow. Next, draw two lines out from your circle towards the outside edges. Connect the two lines with a swooping arch. And then draw a collar. 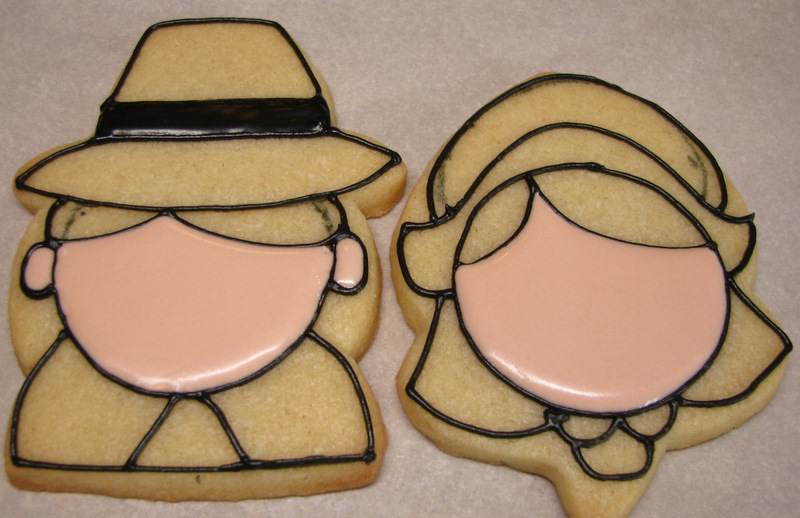 There’s your pilgrim girl outline. Now I’m going to show you how to do the boy, and after that, I’ll show you what to do next. 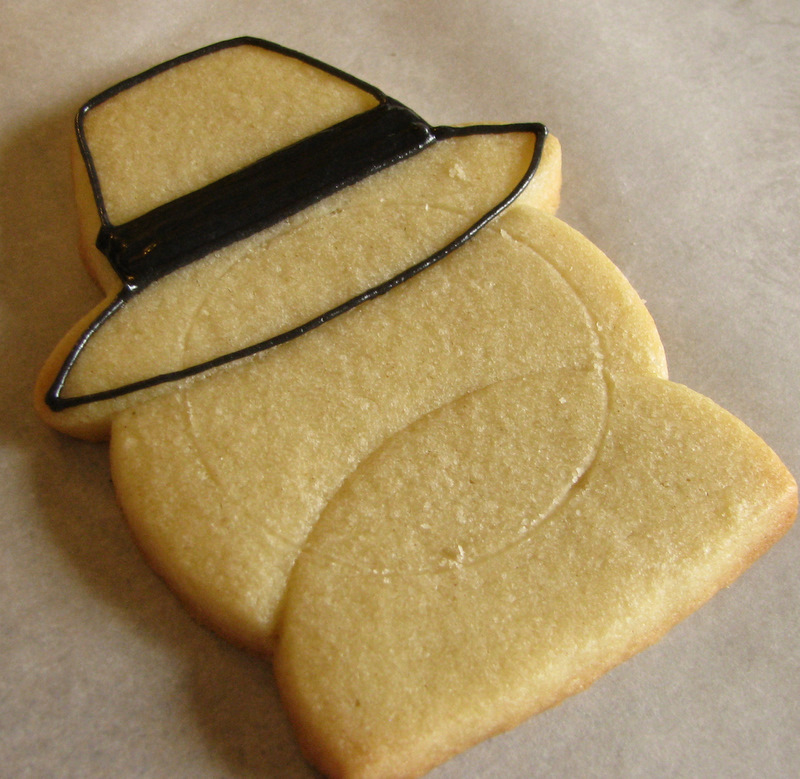 For the boy, I had a small pilgrim hat cutter that I wanted to use to piece a guy together. 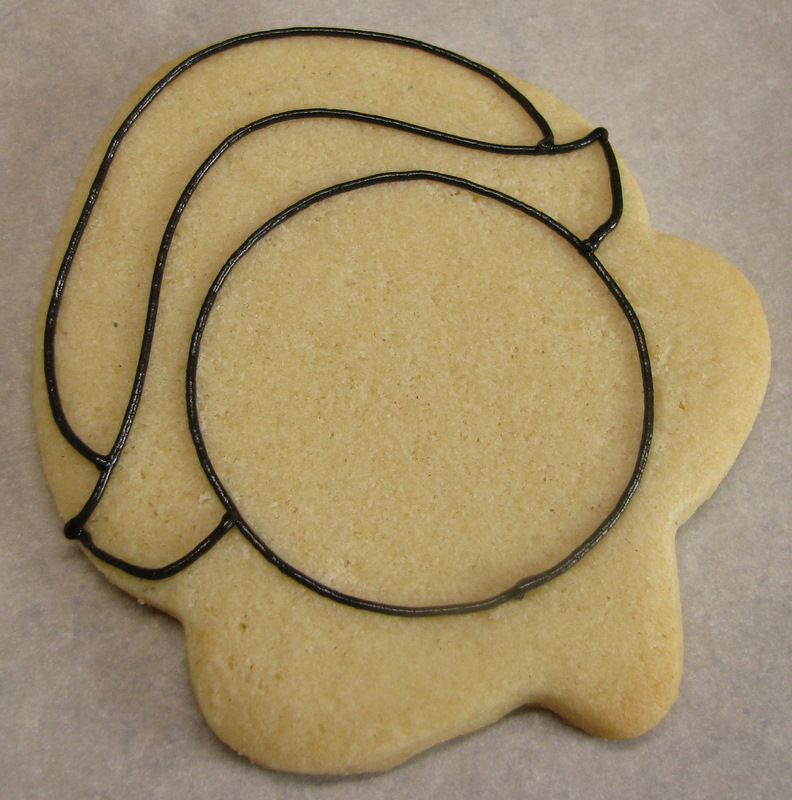 So I used that and the second-smallest circle from the nylon circle set (1 7/8″, but a 2″ cutter would do!). Cut one hat, and two circles, and then cut one of the circles in half. 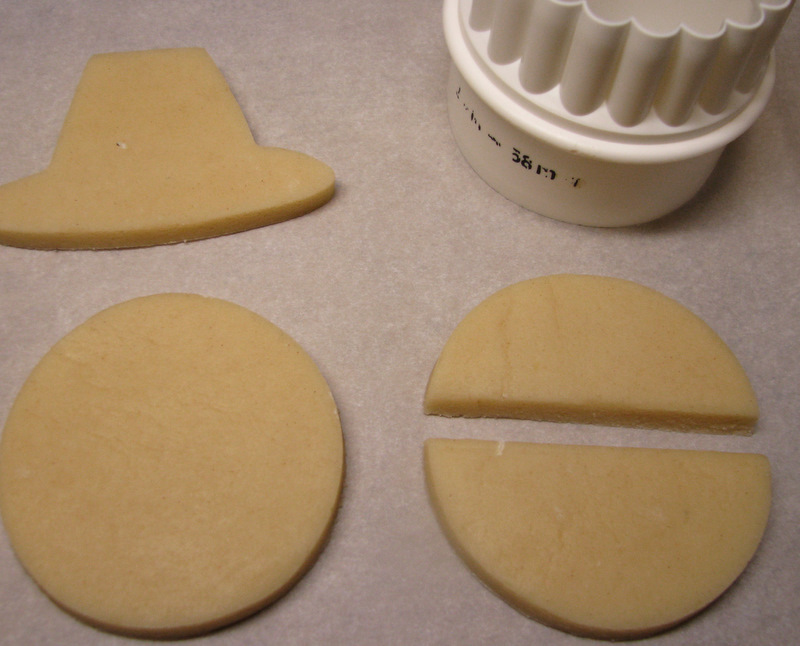 Cut a chunk off one of the circles using the same size cutter you used to cut your circles. Fit one of the half-circles into the first circle. 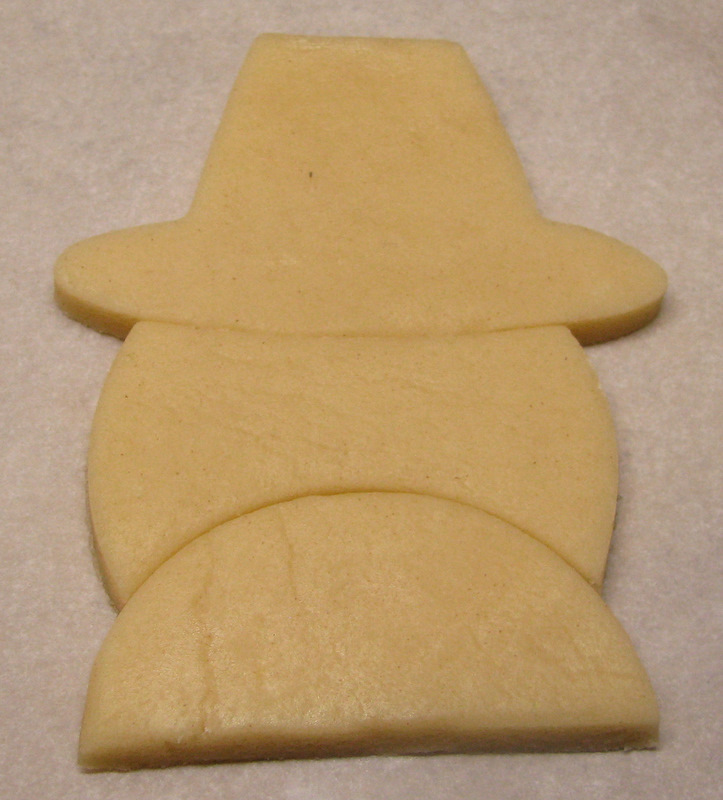 Then trim off the top of the circle with the pilgrim hat. And fit the hat into place. 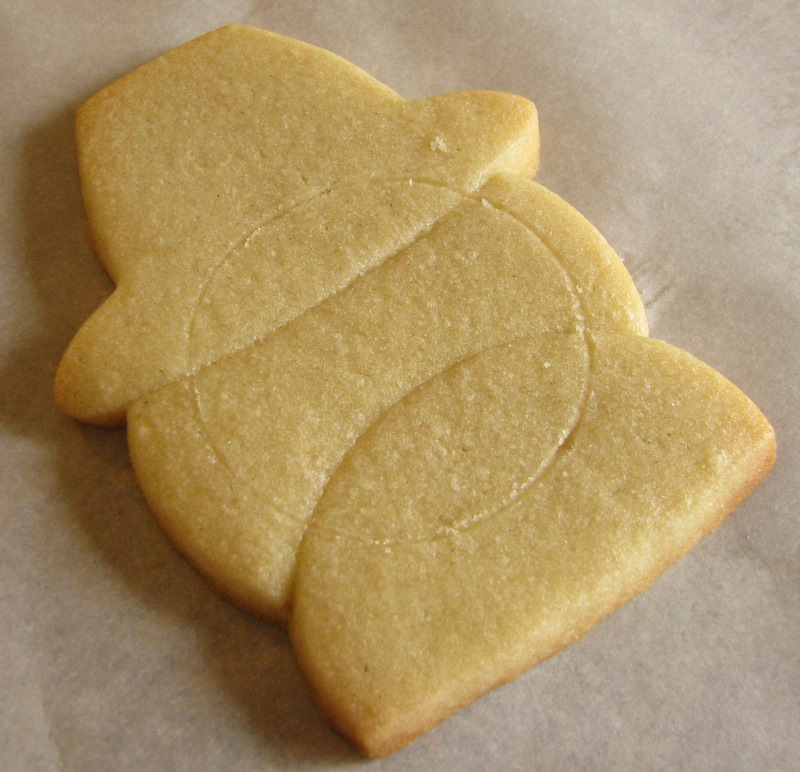 If you happen to have a large snowman cookie cutter with a top hat, you could chop him in half and it would be the same effect. I just didn’t have one large enough. 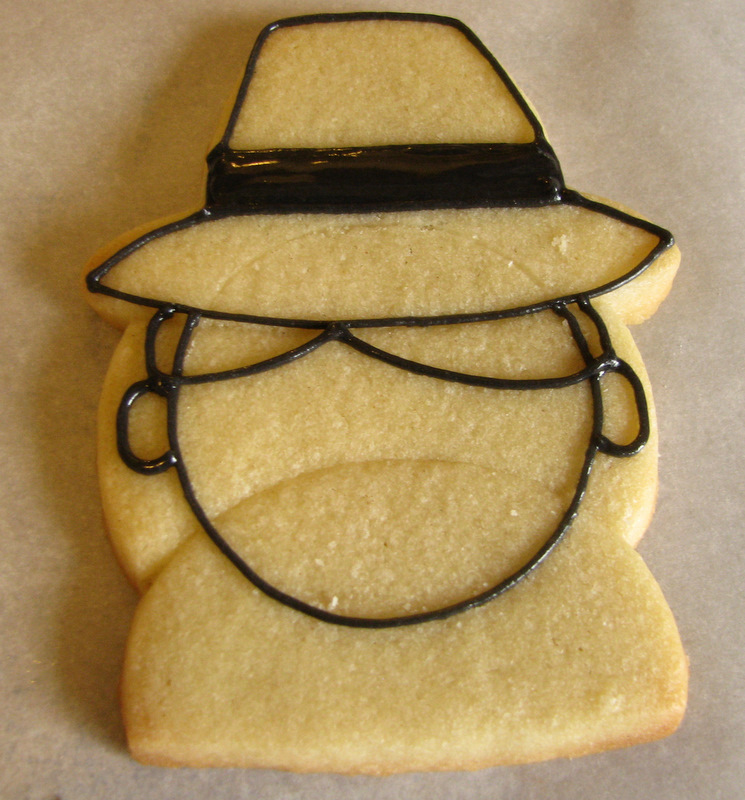 Bake him up and let him cool. Use the 1 1/2″ circle template (same one you used on the girl), to mark where is face is. 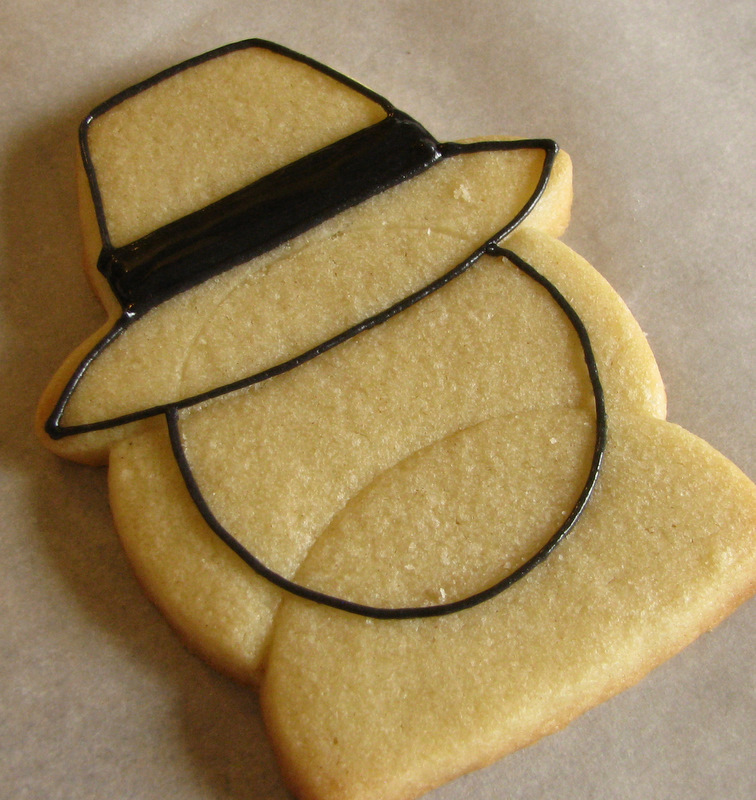 Outline the hat. It’s super easy to do because you’ll see the lines from where you pieced him together. Go ahead and fill in the hat band while you’re at it. And some hair. Notice I went outside the lines a little. I wanted his hair to be a little wider than his face. No problem. Nothing a boo boo stick won’t fix. Scrape out the outlines from inside the hair area. Add a collar. Now you’re ready to add some color. There is definitely no right or wrong way to fill these sections in. This is just how I did it. First I filled in their faces. By the way, this is all Meringue Powder Buttercream that has been thinned to the point that it will smooth out at the count of about 8 seconds. 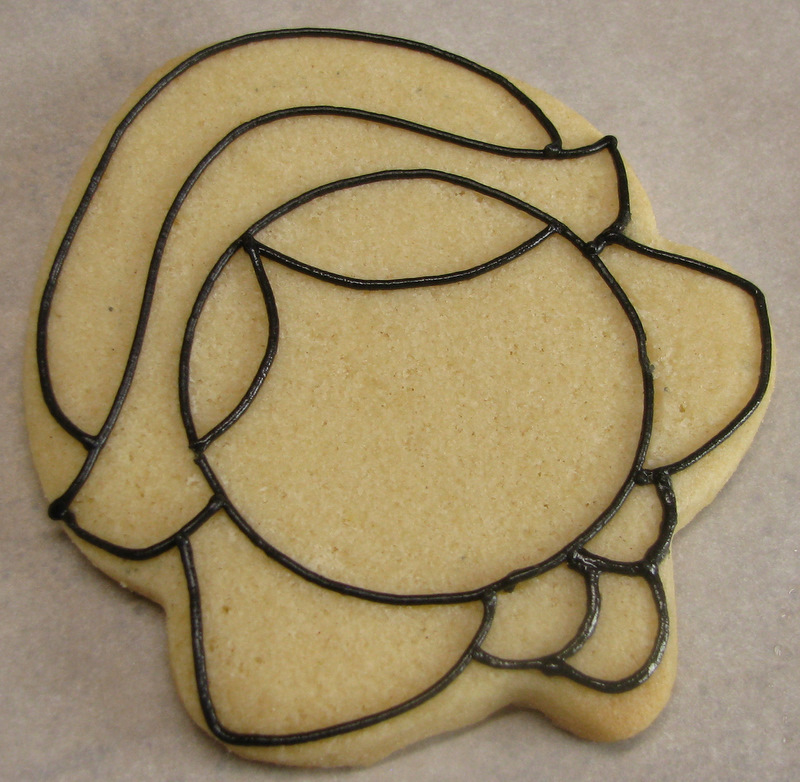 Royal Icing would also work. This flesh color was Copper Americolor with the tiniest drop of Warm Brown. Next, fill in their hair. I did these two different shades of brown, just because I happened to have it, but no need to make two different colors. They’ll look cute all matchy-matchy, too. Next fill in the girl’s hat, and their collars. 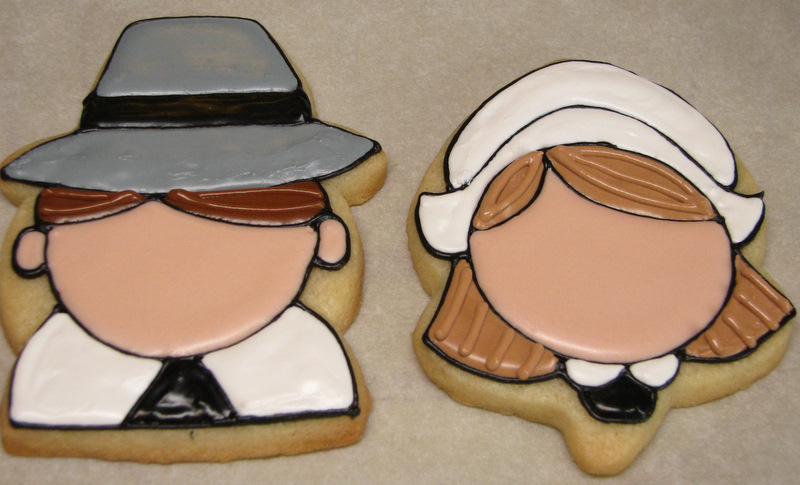 Fill in the guy’s hat with gray (mostly Bright White, with a little drop of Super Black), and the bitty parts of their shirts black. After it dries for a bit, go back and add some outlining to their hair to give it some texture. I just used the same color, and small tip (#1). This next step is totally optional. I actually really hated it after I did it, and wished I hadn’t. But then it started to grow on me. So it’s up to you! 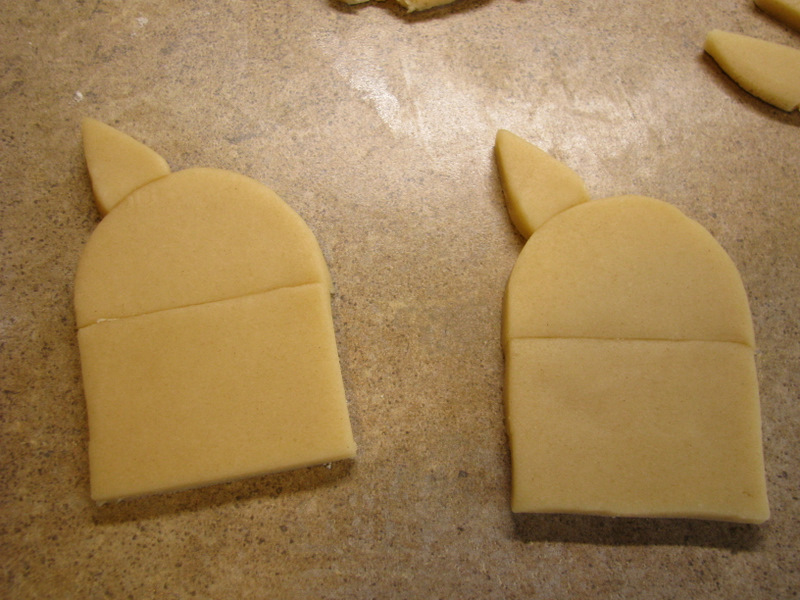 If desired, add some pleat marks to the girl’s hat. Or not. Also add some white buttons to their shirts. 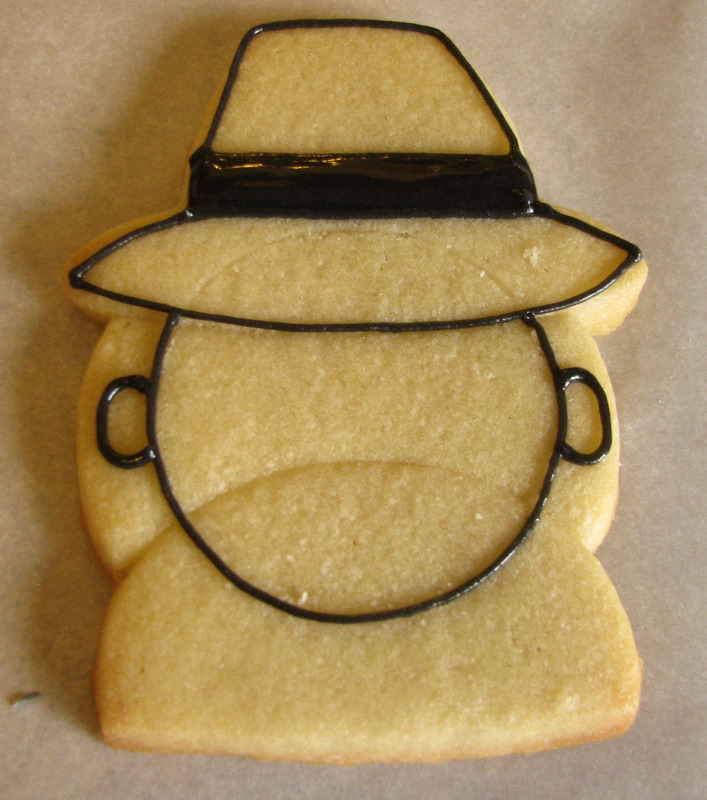 And a yellow buckle to the boy’s hat. Then the faces. OHHHHH the faces! I really hate doing faces. 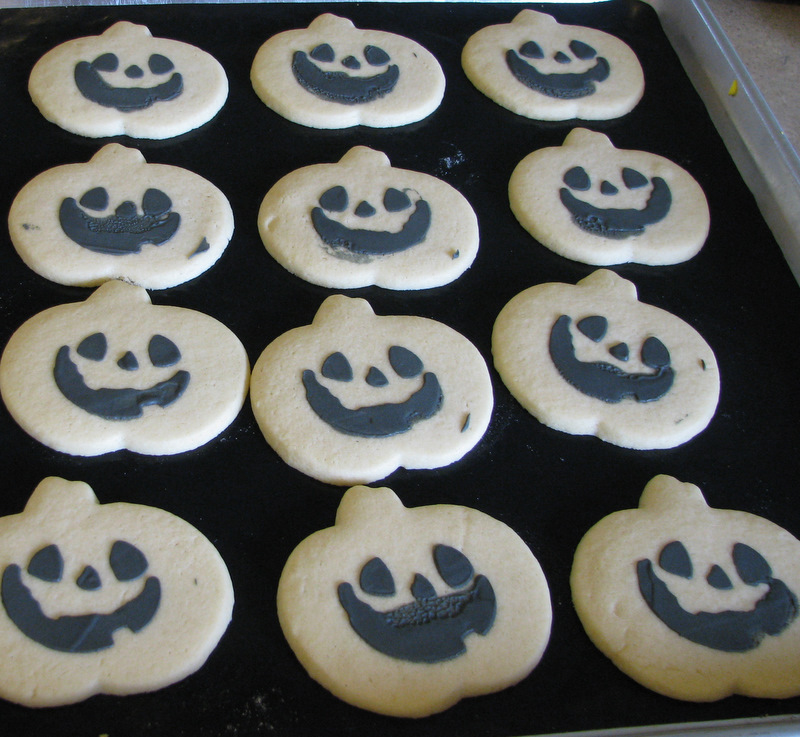 This is how I did it the first time, and I really, truly hated how they looked. I think maybe it was the nose. I don’t know. Noses are hard. 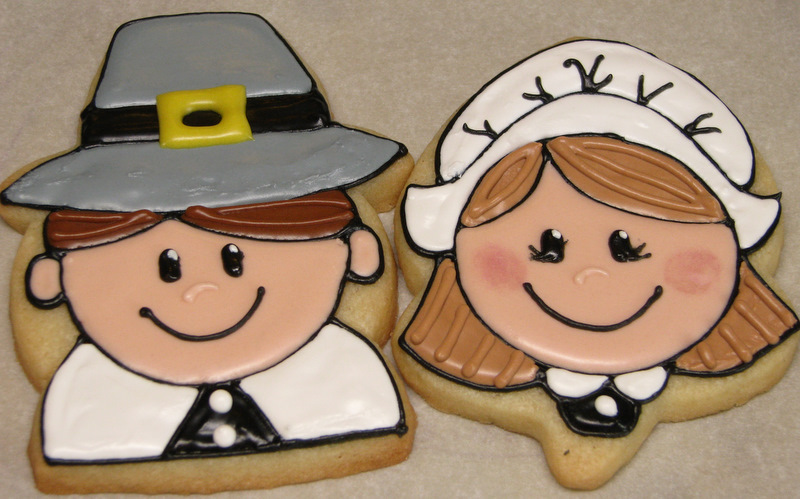 So before you put a face on your pilgrims, practice a little, and also maybe check out how Sugarbelle does faces, because they’re totally cute. The way I make eyelashes is really easy (but I didn’t get a picture). Pipe on some black ovals in pretty thin frosting. 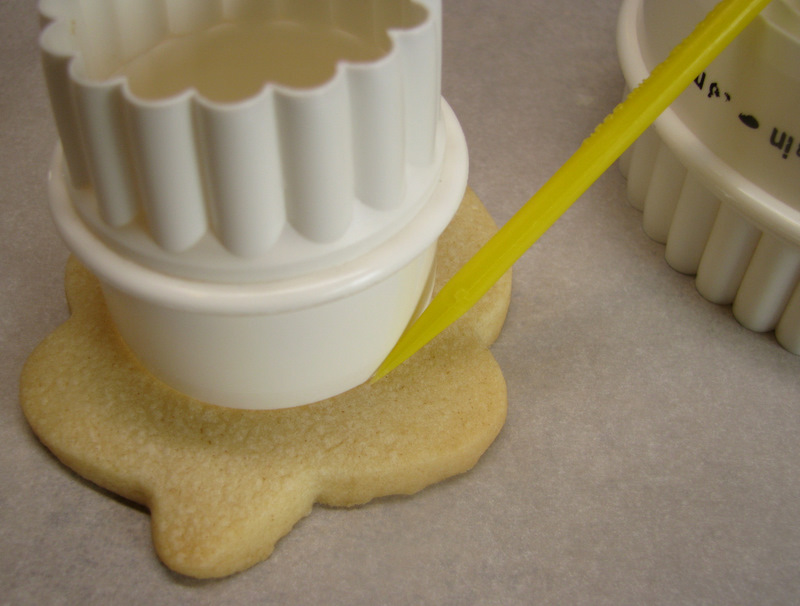 Then, working quickly while the frosting is still wet, use the tip of a sharp boo boo stick to pull the eyelashes outward (sometimes boo boo sticks can get a little dull with use. Keep one sharp for jobs like this). It might take a few tries, but you’ll get the hang of it. 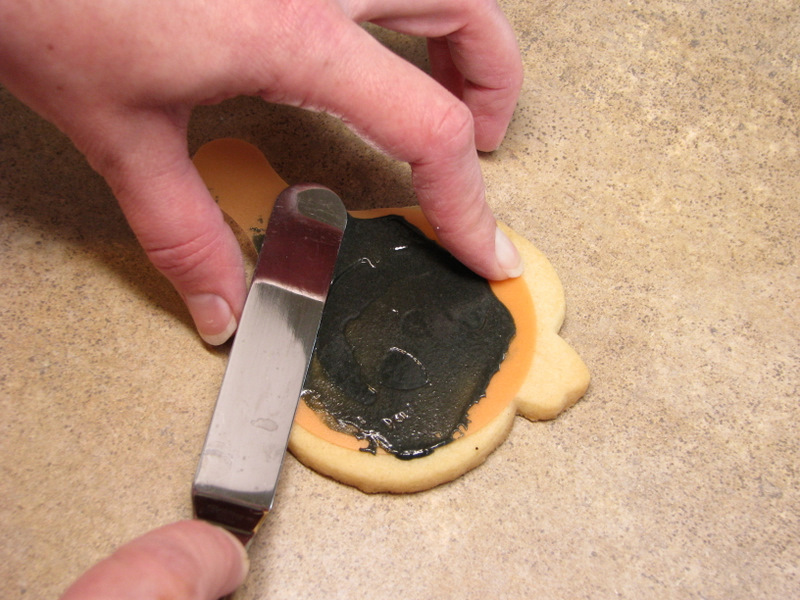 After you’re done, add a little dot of white frosting to the eye to give it some sparkle. And you’re done! Coming up, I’ll show you how I pieced my Indian together. But don’t forget that Sugarbelle has an Indian tutorial TODAY if you want to get decorating. 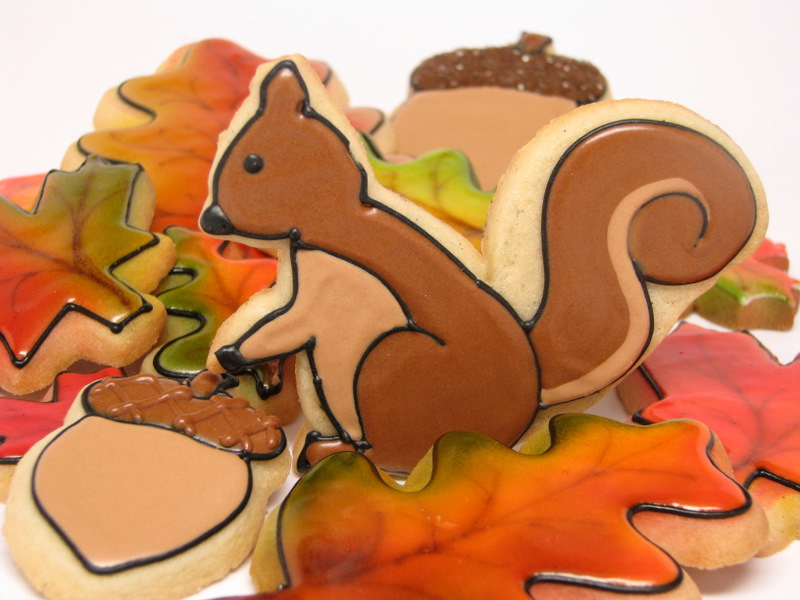 Leaves, Acorns…. And a Squirrel. Have I mentioned that I love fall? I do. 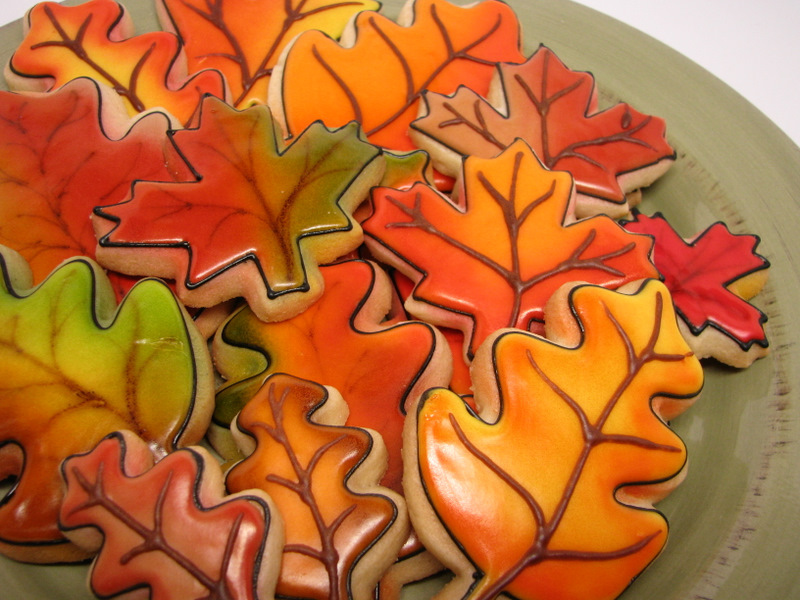 I love the leaves, the crisp air, apples, pumpkin pie… I think Thanksgiving may be my favorite holiday. 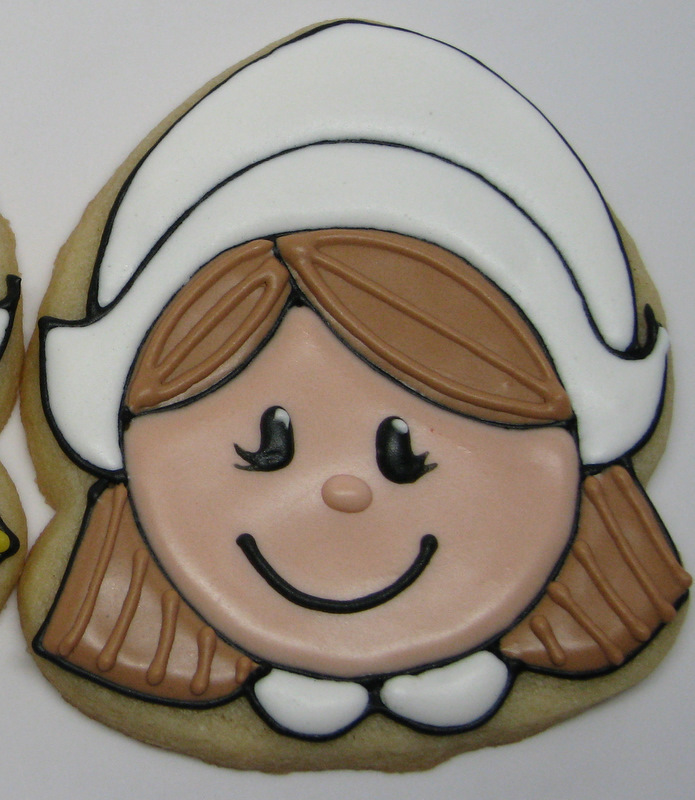 I love Christmas too, and I can’t wait to start doing some fun Christmas cookies. But I have to tell you, I get a little cranky when I’m in the stores and they’re already playing Christmas music, and have all their Christmas stuff up as if Thanksgiving is already passed and gone. It’s not! It’s still 2 weeks away people! I’m going to give Thanksgiving its due, by golly. With leaves! And acorns! And a squirrel! Ha ha! He’s pretty rough! I wanted something a little more stylized with clean lines. Mike told me I should ignore the tail shape and do my own thing. That Mike, he’s (almost) always right! Speaking of that… I have a new toy. This is kind of a funny story. 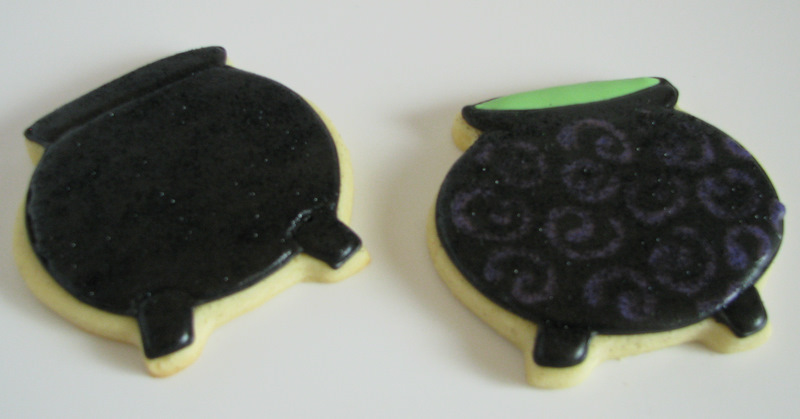 Mike has been telling me for probably 2 years or more that we should get an airbrush and try airbrushing cookies. 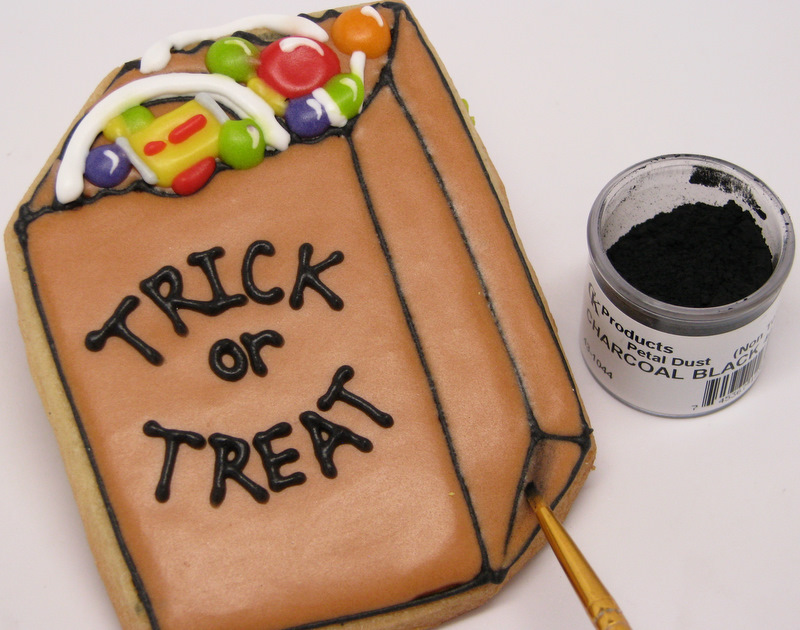 I kept saying “I don’t know… not crazy about the idea.” Because when I thought of airbrushing on food, I thought of the kind of cakes that end up on Cake Wrecks. 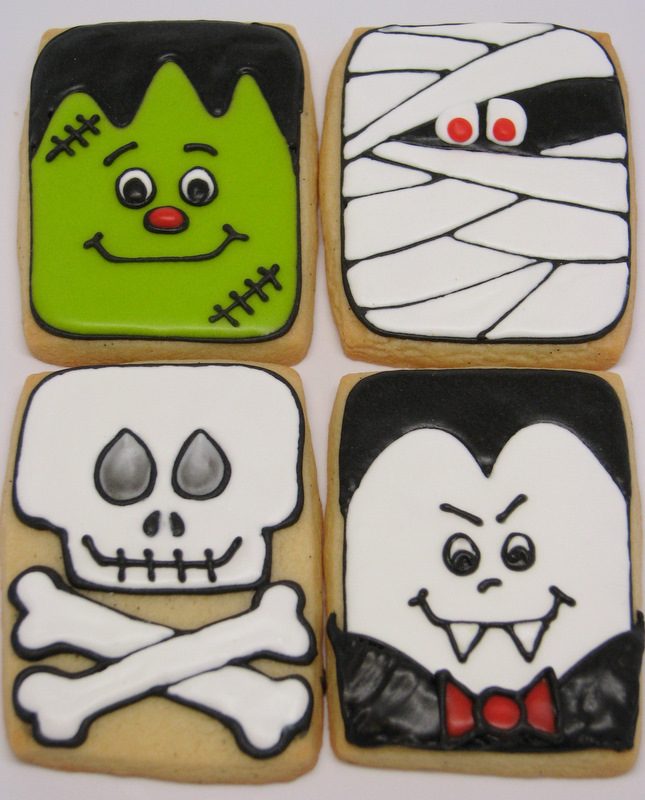 And I actually hadn’t seen very many cookies done with the airbrush, but the ones I had seen were… um… aesthetically challenged. It was a tough sell for poor Mike. So I just got it recently, and I’m still not a pro– at all. But it’s fun! I am loving it, and I’m seeing the potential. 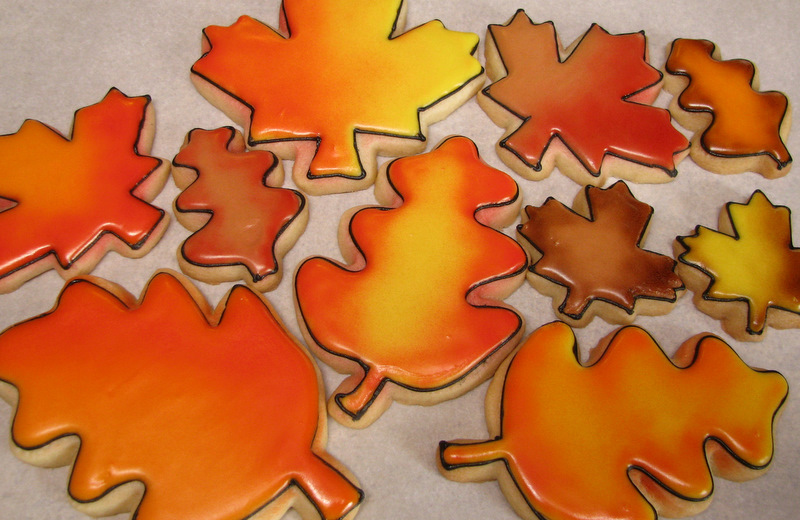 I started with some fall leaves– because it’s fall, and leaves are pretty forgiving. And they’re colorful. I made a few, and made them very basic, solid colors. I used Meringue Powder Buttercream, and let them dry overnight. Notice I left a few of them white, with no outline. I wanted to see what I could do with only airbrush color. Yes that middle one has a big gouge out of it. I’m such a klutz!! But I had to leave it in the picture, because I wanted all of them in the same spot as they were in the pre-airbrushed picture, so you could see the comparison. So there you have it. Here they are all pretty on a plate. I was going to pipe veins on them, but decided to try airbrushing the veins. It took some getting used to! It’s funny– it’s kind of like an Etch-a-Sketch, where you don’t really know where you’re aiming for a while. I would do the main vein down the center of the leaf, and then want to come back and have a vein coming off of that one, and I had no idea where to aim and how to match it up with the existing line! 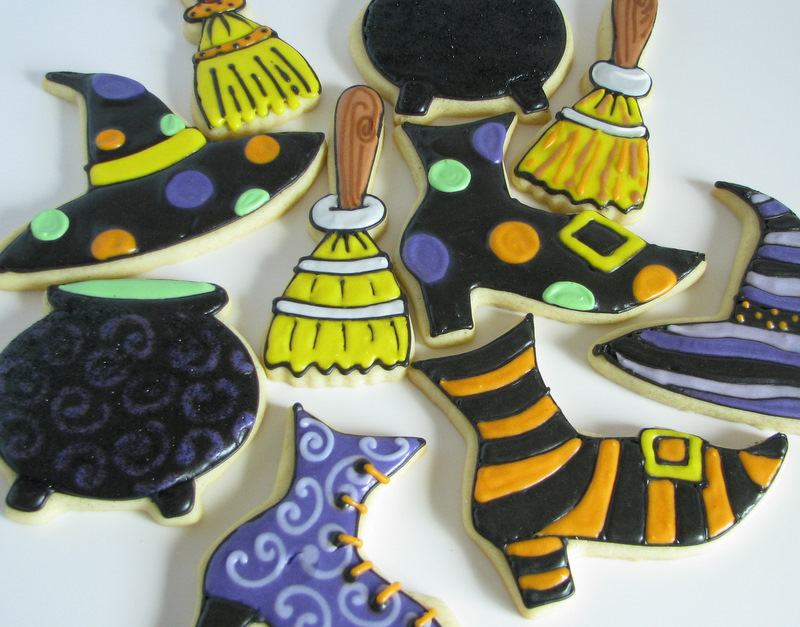 So you’ll see LOTS of mistakes up there in those cookies. But by the time I was done, I had a pretty good handle on it. Not perfect, but the learning curve isn’t huge. Unfortunately, I forgot to get a picture of them before airbrushing, but it was pretty much the same as the first picture up there– minus the white ones. 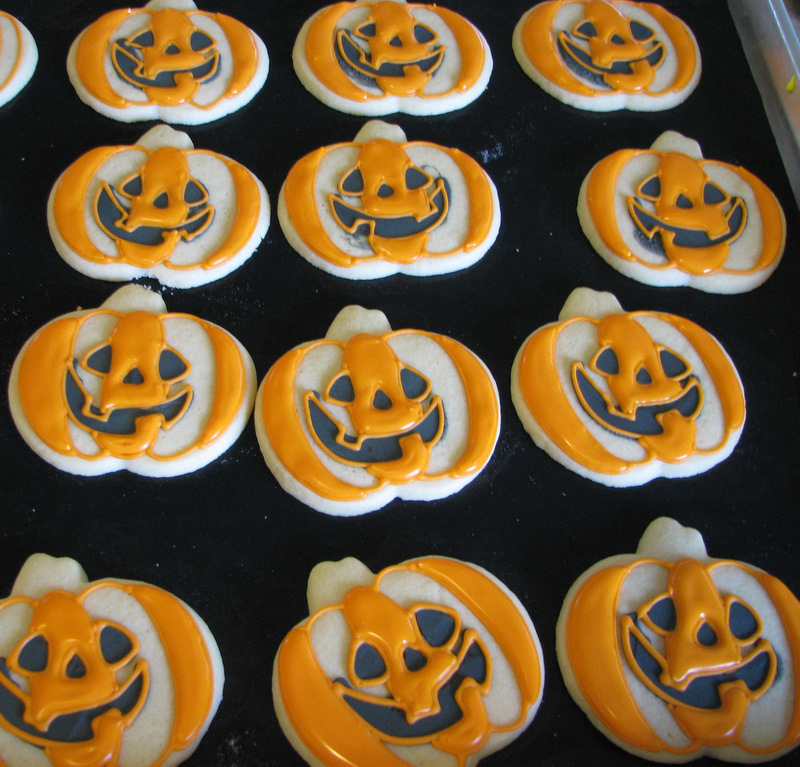 This is what they looked like before piping some veins on them. I can’t decide which ones I like better. I like the simplicity of these, but the multi-color ones are growing on me. I like them all together like that. 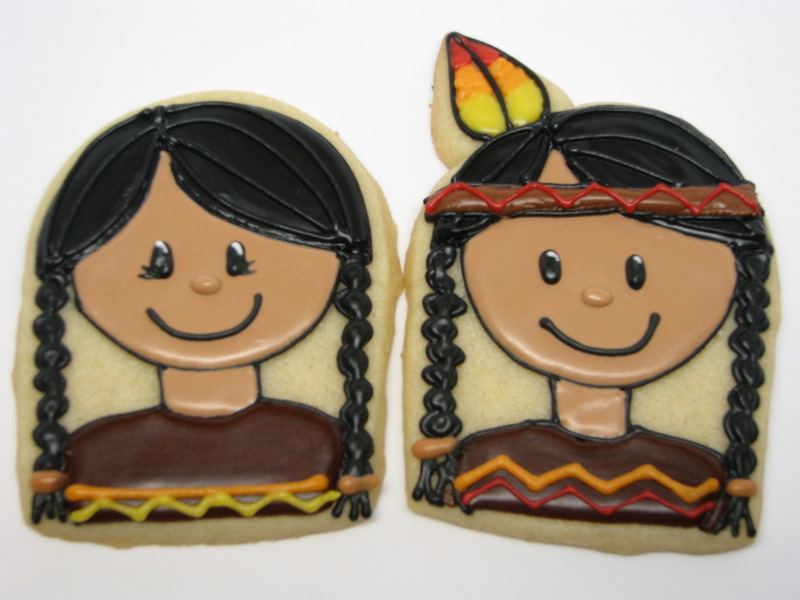 So what do you think about airbrushing on cookies? Have you done it before? Do you want to see more? I will keep practicing and pass along what I learn. 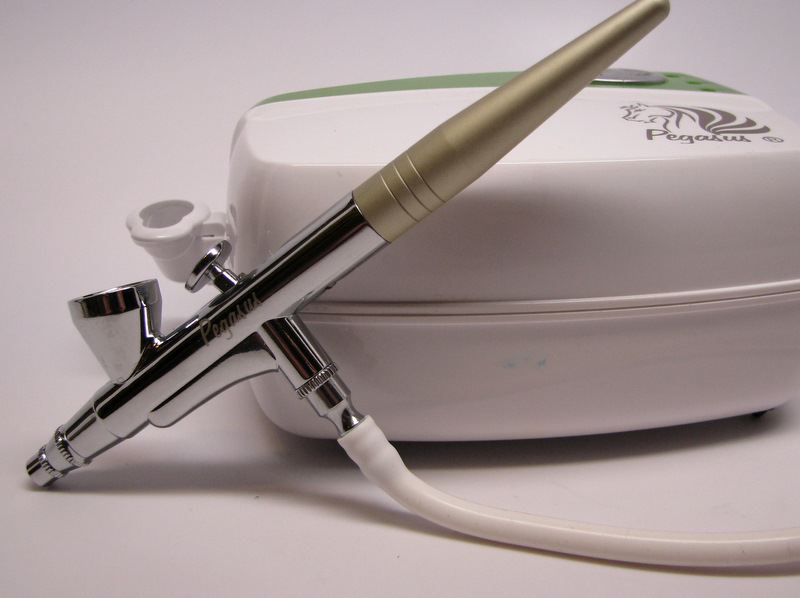 I’m going to be selling the airbrushes in my shop, and as soon as I get them, I’ll do a how-to post and maybe a video, and most likely a giveaway. So stay tuned for that. In the meantime…. 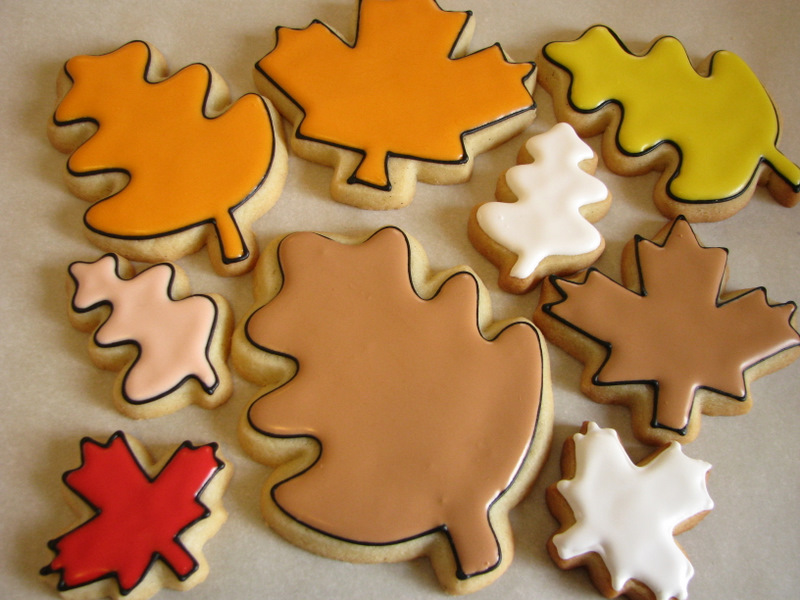 Enjoy the fall!! So I said was going to get another post up last Friday. Not the one that just passed yesterday— the one a full week before that. Then I had sick kids, I was sick, and you combine that with time flying at break-neck speed, and here we are. Life happens. Sorry about that. But hey, let’s not look back. Let’s look forward! 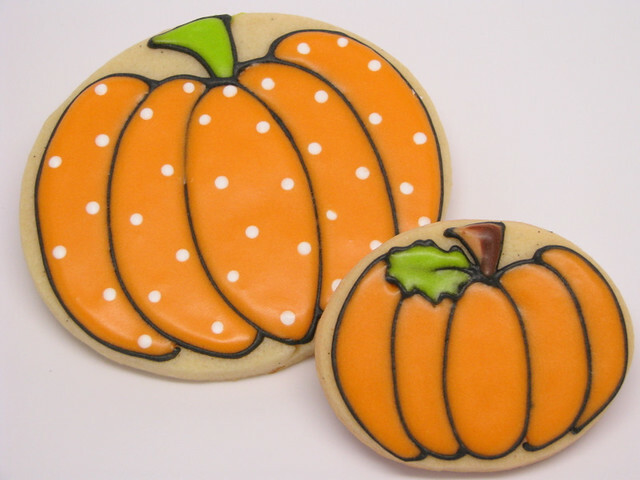 I have some Halloween ovals to show you! I really should have shown you the ovals first and then ended with the rectangles, because I really liked the rectangles better, which sorta makes this anti-climatic, but such is life. 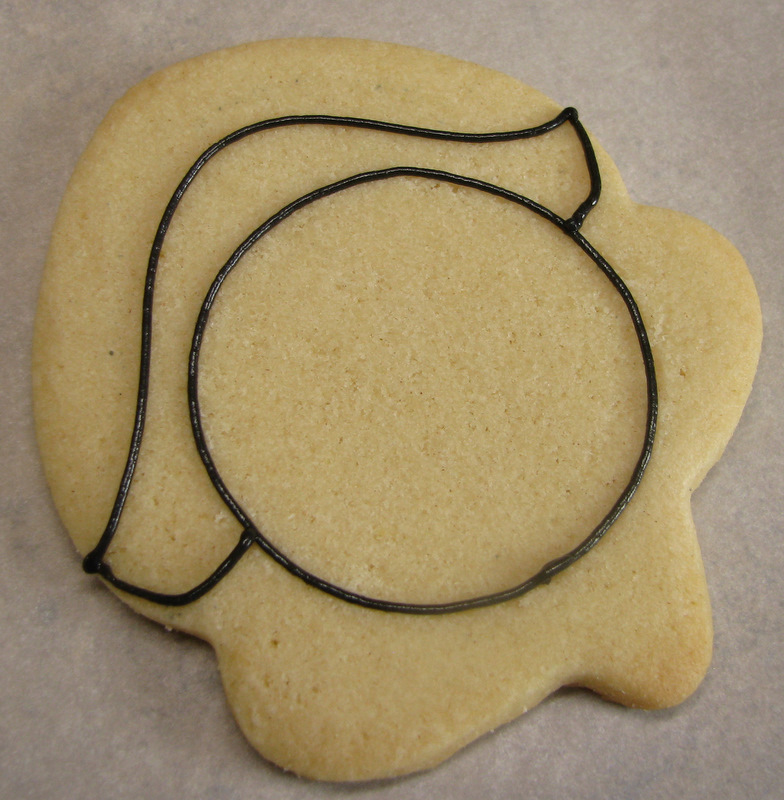 So we have a set of oval cookie cutters. Half are plain-edge, and half are crimped edge. 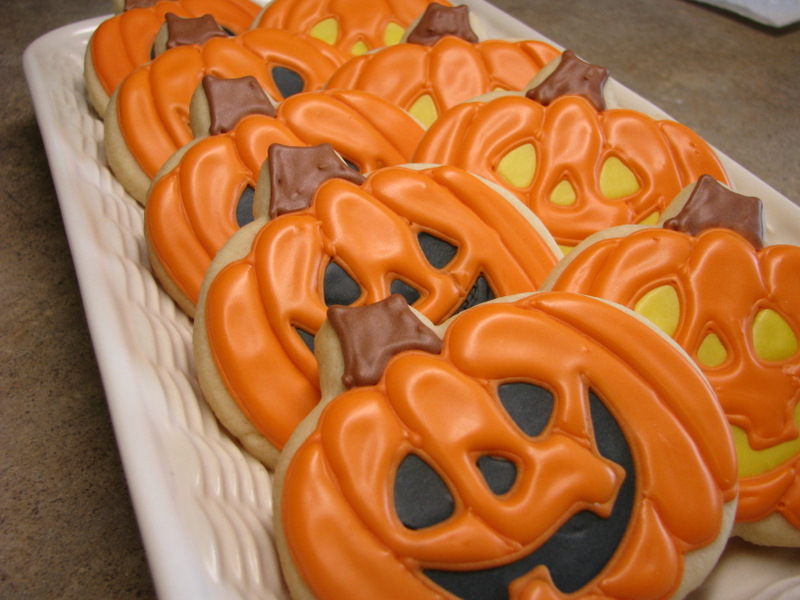 I used the plain edge for these cookies. 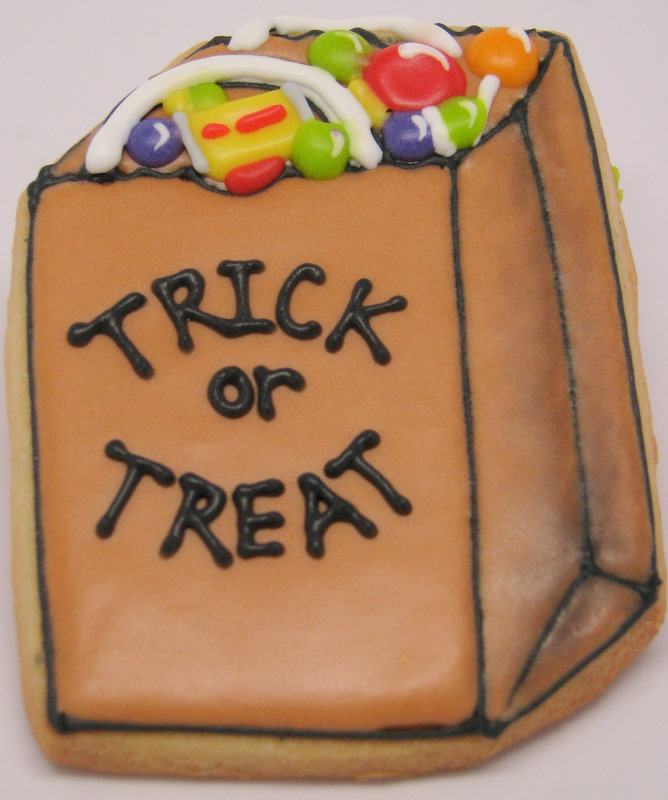 First are some Halloween treat buckets. These are easy. 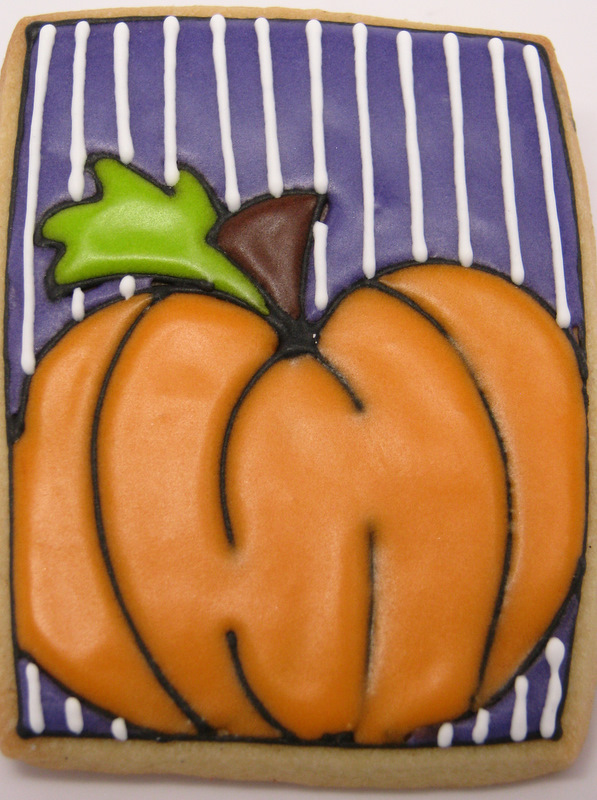 Just draw an oval in the center that is about three-quarters of the height of the pumpkin. 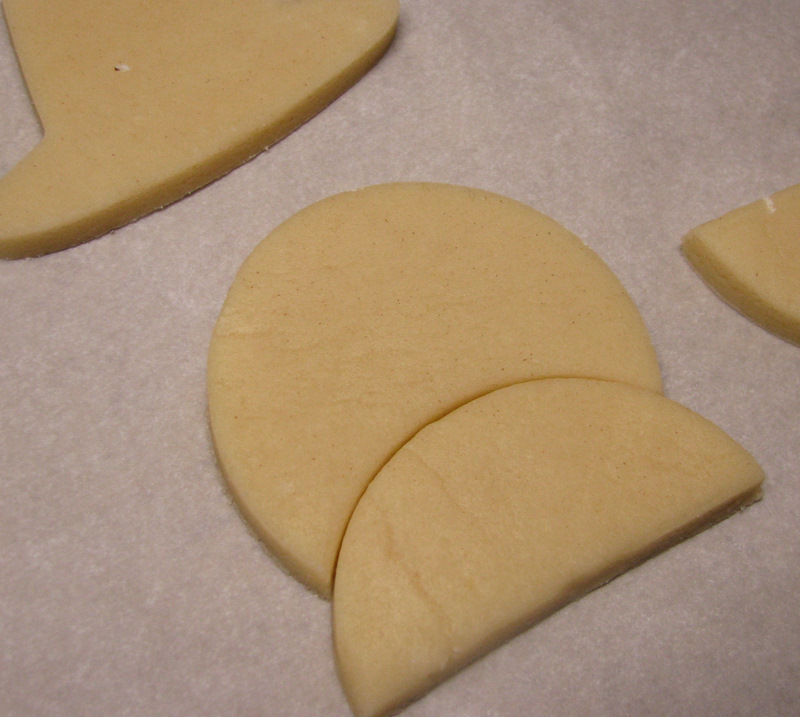 Then add ridges heading outward and slightly upward. Does that make sense? Then add a stem and maybe a leaf. You can have pumpkins in all kinds of sizes. 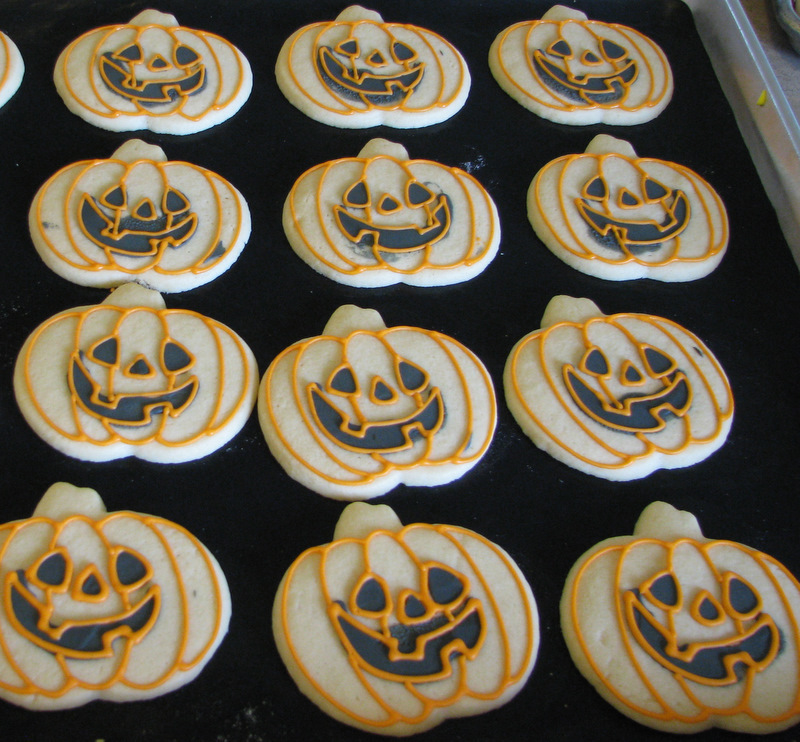 Who needs pumpkin cookie cutters? Next, I tried just a bunch of candy. It looks too stark to me. Maybe more candy? Here are the rectangles and ovals together, just for comparison’s sake. Definitely like the rectangles better, but the ovals are cute in their own way. These next guys were my favorite, and they were also the most simple. 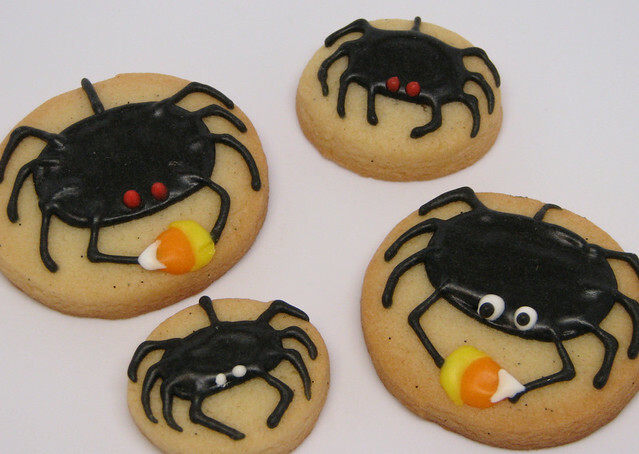 I wanted something really easy for the smallest ovals, so I decided on spiders. I loved doing them. 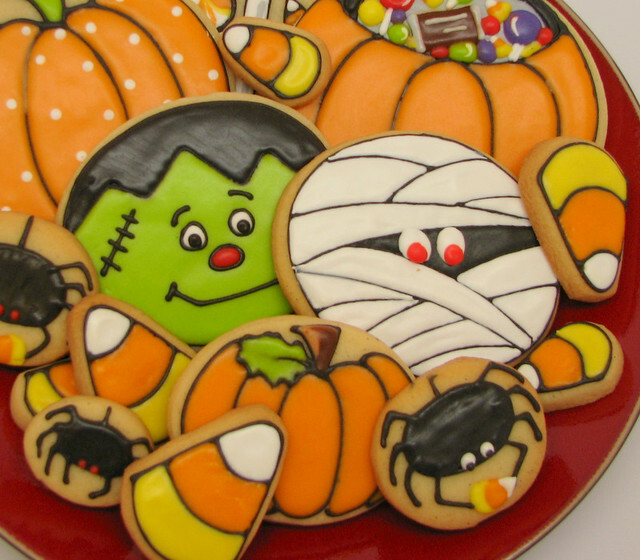 They took about 10 seconds and added a lot to the plate of cookies. And my other favorites were equally easy. Candy corn! What? You say these aren’t ovals? Well, you would be right. 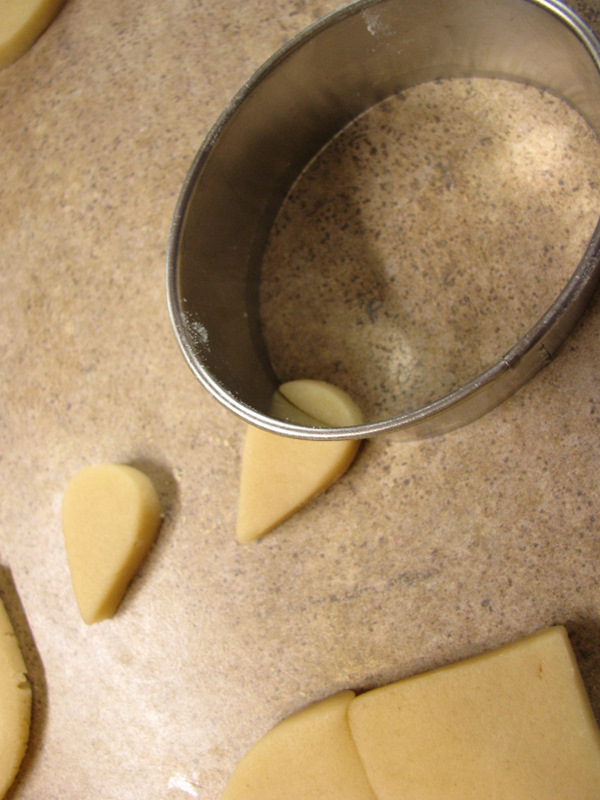 But all I did was cut a sliver off of each side of the oval (at an angle) to make cone shapes. 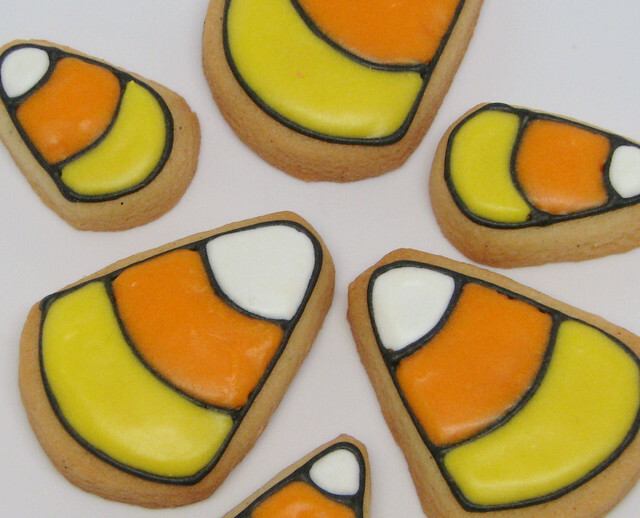 I loved that it worked, because now I can make any size of candy corn. The smallest were almost the same size as real candy corn. Cute. 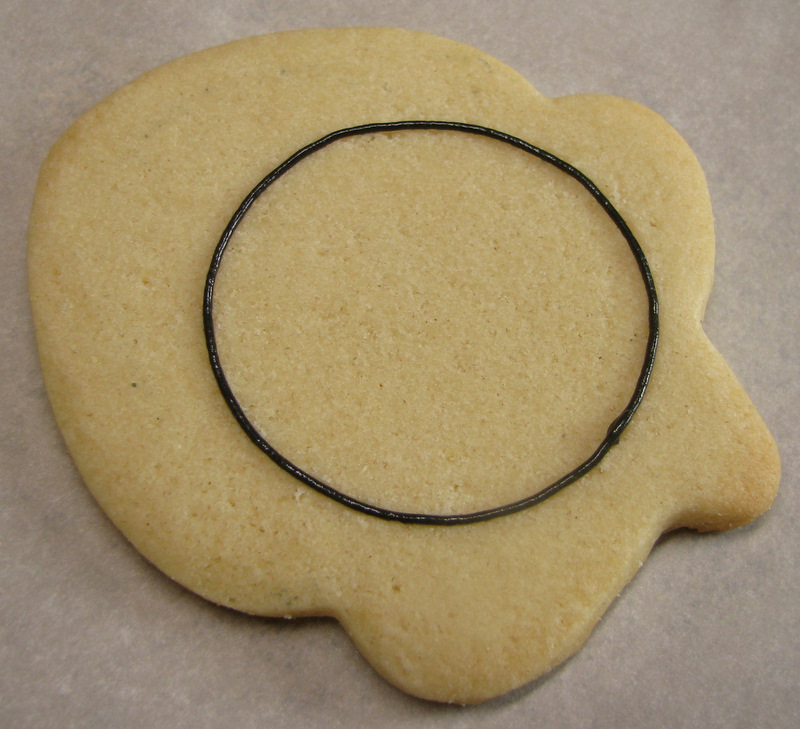 I have a handful of sets of oval cookie cutters to give away. 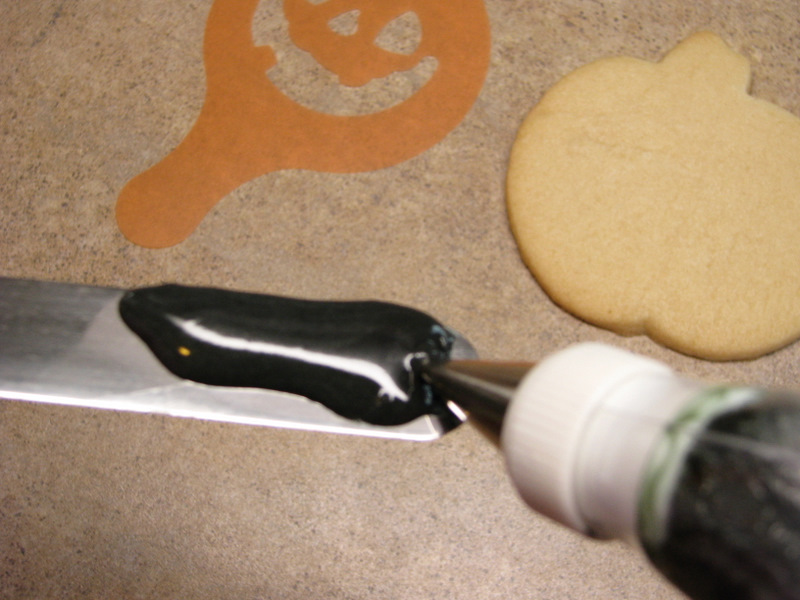 I’m probably not going to get them to the winners by Halloween, but the good news is that the uses for oval cutters is ENDLESS. 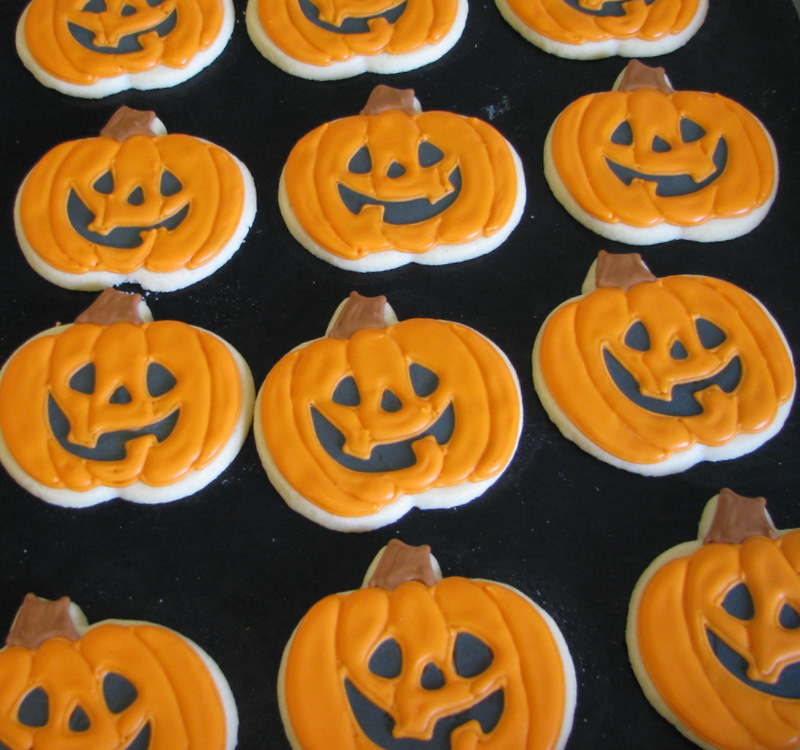 You can use them all year long, and then when next Halloween gets here (in the approximately 2 seconds that will take), you’ll have them to make all the pumpkins, candy corns, spiders, or monster faces you want. 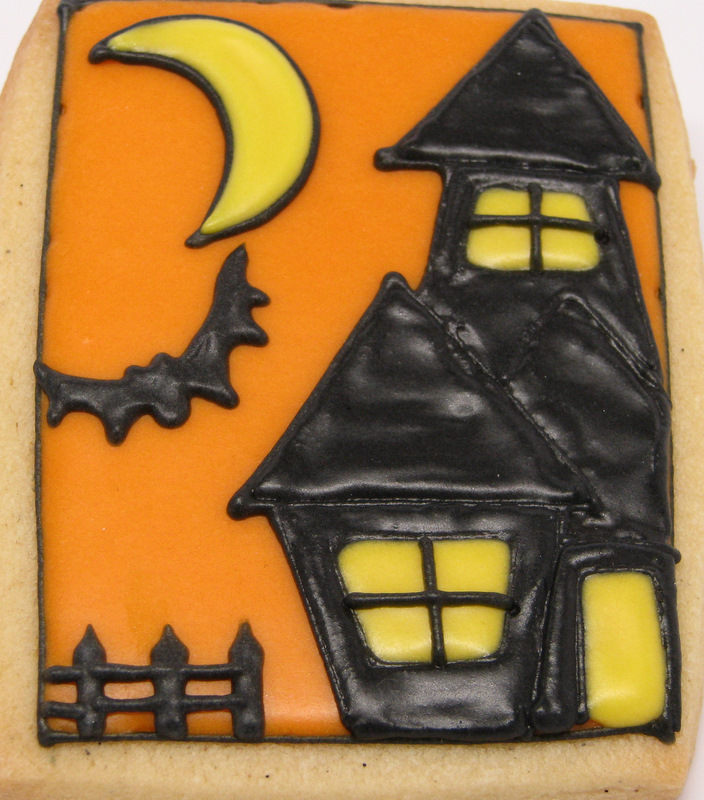 Comment on this post by Wednesday, October 26, midnight, and you’ll be entered to win a set of your own. I’ll choose 5 winners using Random.org. Please enter only once. Thanks for reading! 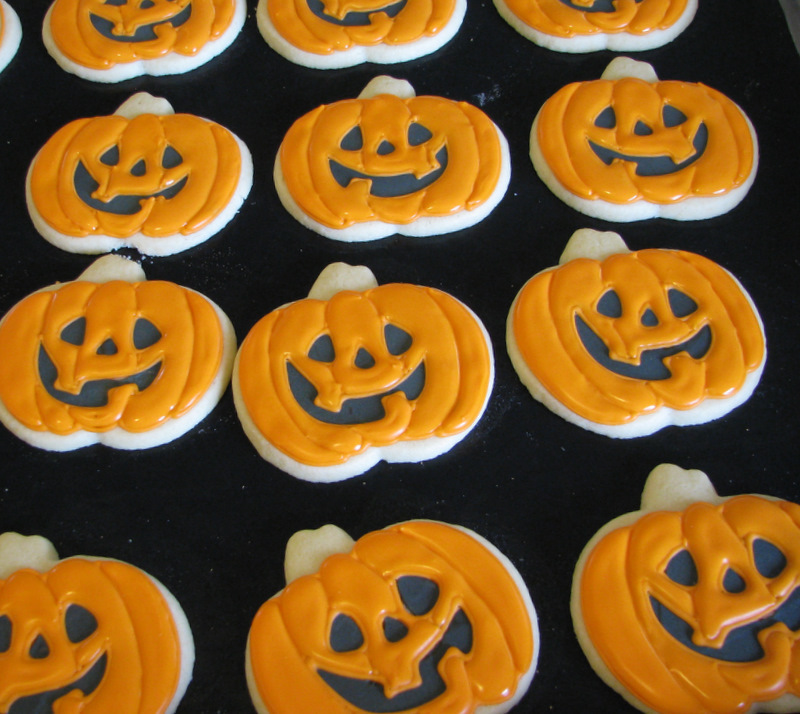 Good luck this week getting all of your Halloween preparations together. I have 4 little costumes to figure out this week. 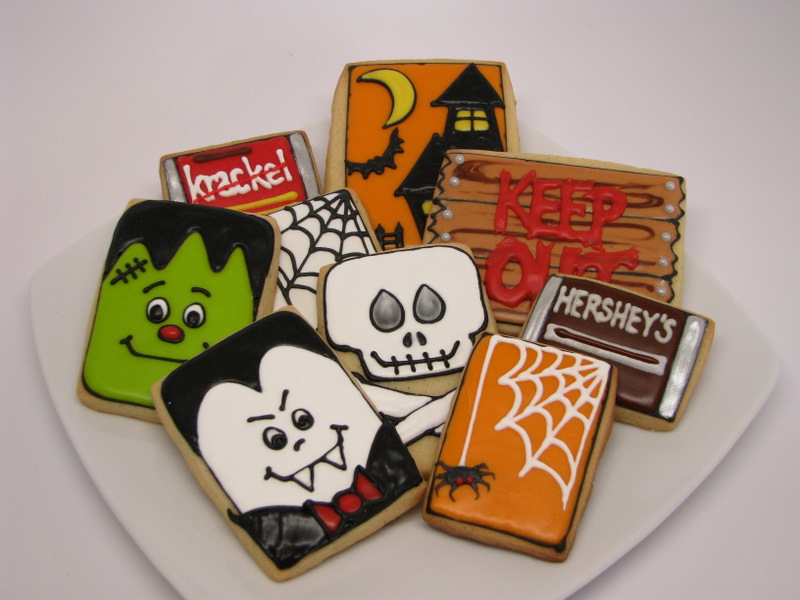 Do you have a lot to do before Halloween? I’ve been talking a lot about my desire to learn to think outside the box a little more. I am always completely blown away by Callye (Sweet SugarBelle) and her ability to make anything out of nothing. 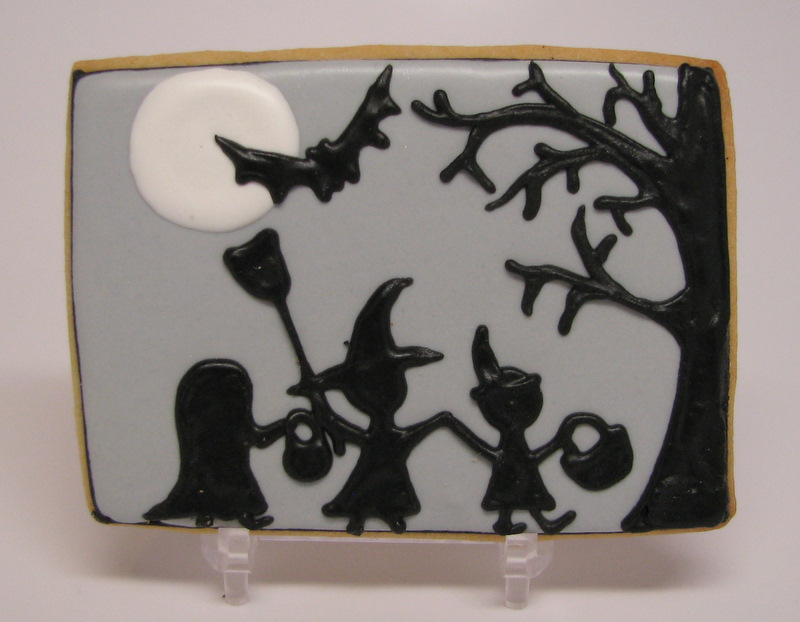 In fact, I really need her to be my buyer because I’ll pass right over certain products (like the Wilton Fangs cookie cutter, for example) and then she’ll do something totally crazy awesome with it. So I’m trying to learn. And after meeting Callye last week, and learning some of her methods for thinking outside the box, I came home totally stoked to try some new things. 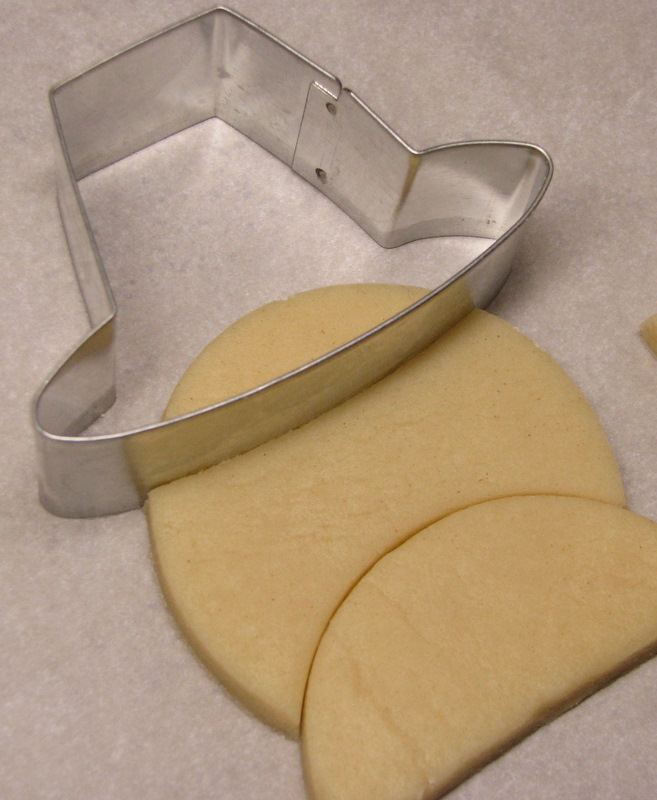 I love the rectangle set of cookie cutters. I actually resisted liking them for quite some time. Because really, you can do without them in a pinch. You can use a ruler and a pizza cutter and get all the rectangles you could ever want. But once I bought this Fox Run Set, I wondered why it took me so long to get them! They have come in handy for so many things, and are so infinitely easier to use than a ruler and pizza cutter. I have been wanting to feature them for a while, but didn’t really know what to do with them. Well, I came home from Cookie Camp all fired up to be creative. 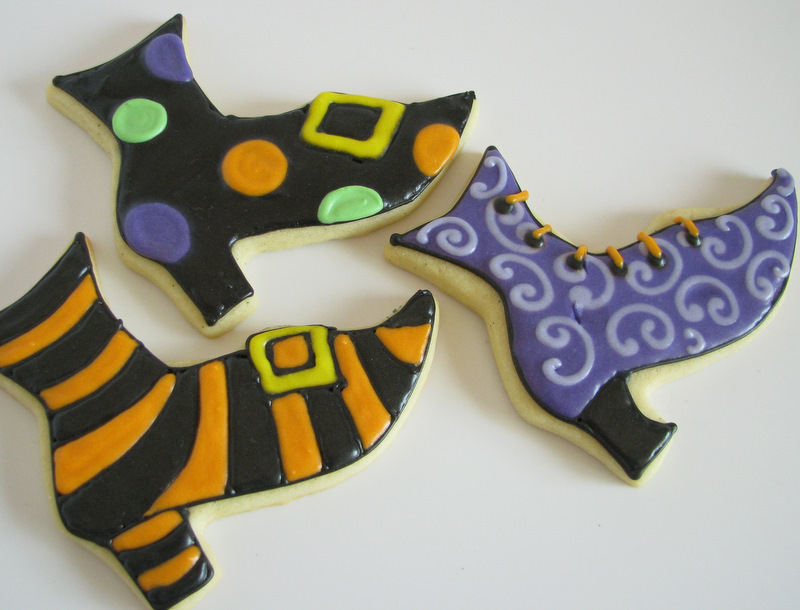 I knew I wanted more Halloween cookies on the blog. I knew I wanted to feature the rectangle set. So I decided to think outside the box by thinking inside the box. Get it? Inside? The box… because it’s a rectangle…. 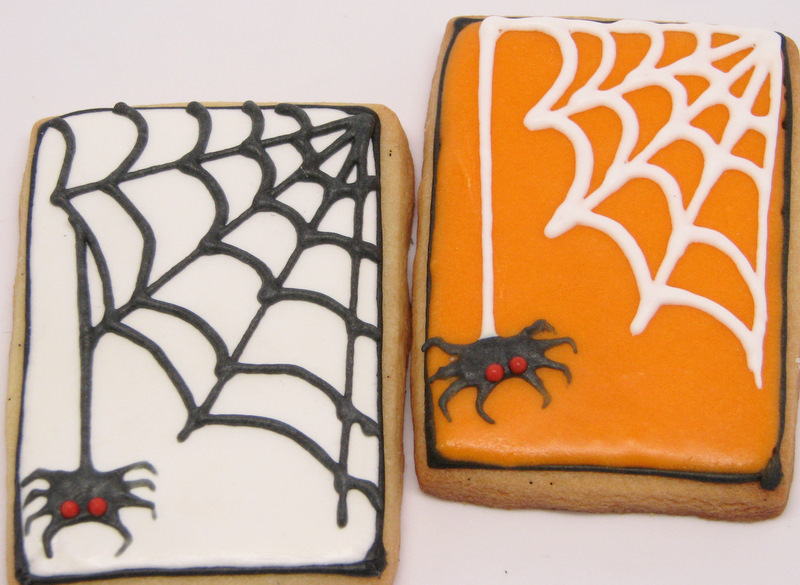 Then I thought just some spider webs would be cute and simple. Easy, simple. Anyone can do it. Outline, flood, let dry, then add a spider web and spider. Easy peasy. Then I got crazy ambitious. 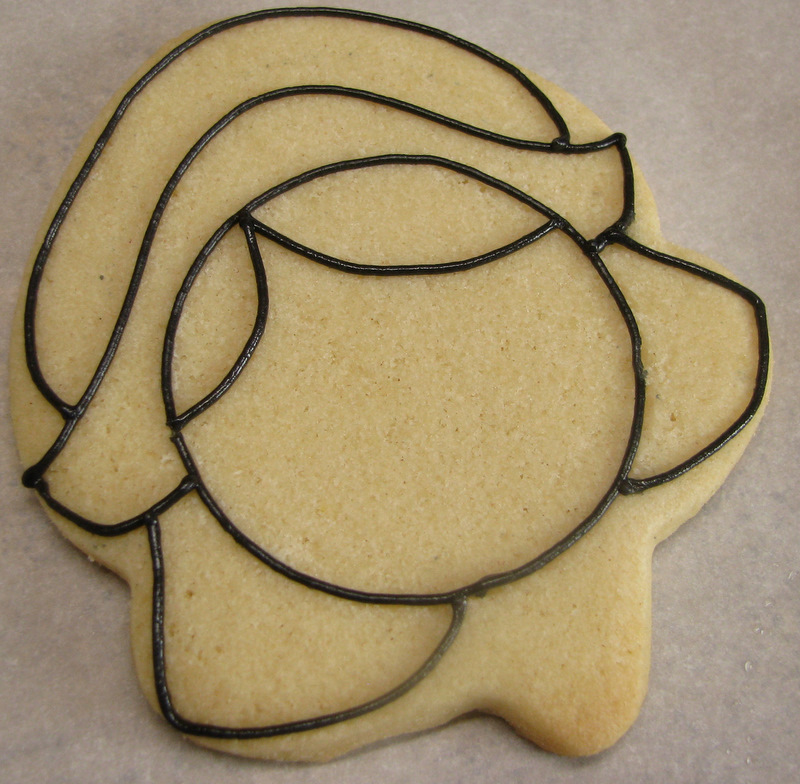 I had just seen the most adorable cookie done by Haniela, that was just a silhouette of a child blowing a dandelion. And then I saw a Halloween card that had the silhouettes of trick-or-treaters. I figured it was a sign, so I tried it. I think it has potential! It isn’t perfect, but it’s kind of a cool effect. I want to try it again soon. So then I got off my ambitious kick and went back to simple and less creative. I don’t have a Kopycake (obviously! Ha ha), and I really didn’t feel like spending a ton of time getting the font just right, so I didn’t. I just looked at a picture of fun-size Hershey bars online and went for it. 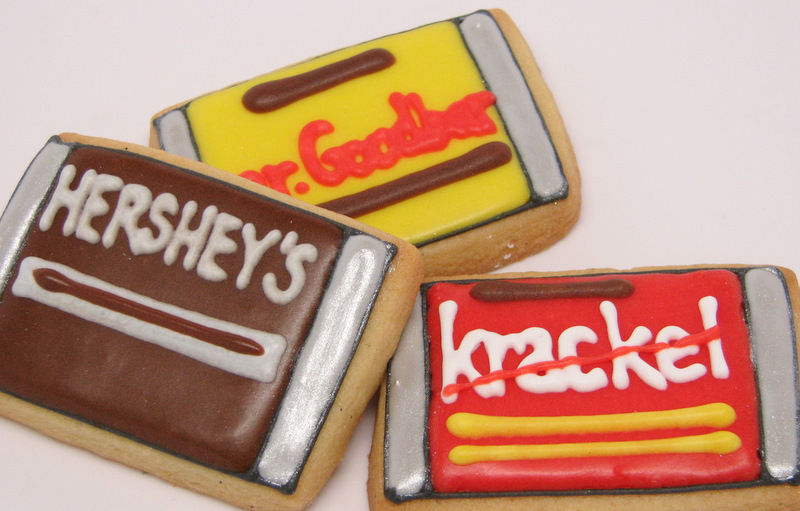 These are pretty small– about the actual size of a fun-size candy bar. So I kept them super simple. 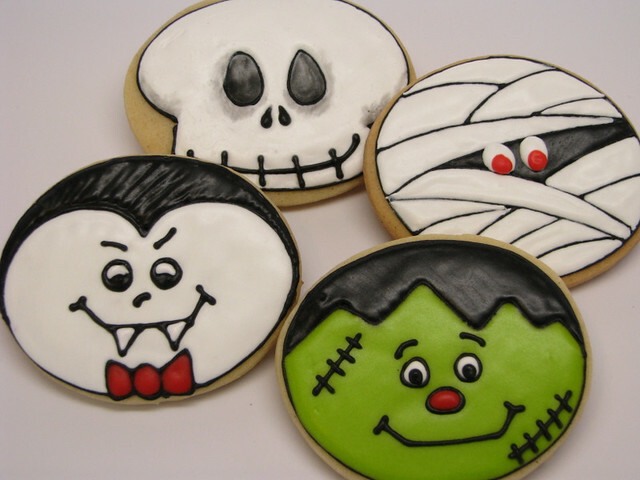 Although it doesn’t look too impressive up close like this, when they were mixed into a platter of cookies, it totally worked. I’ll show you that in a minute. And then I got an idea. 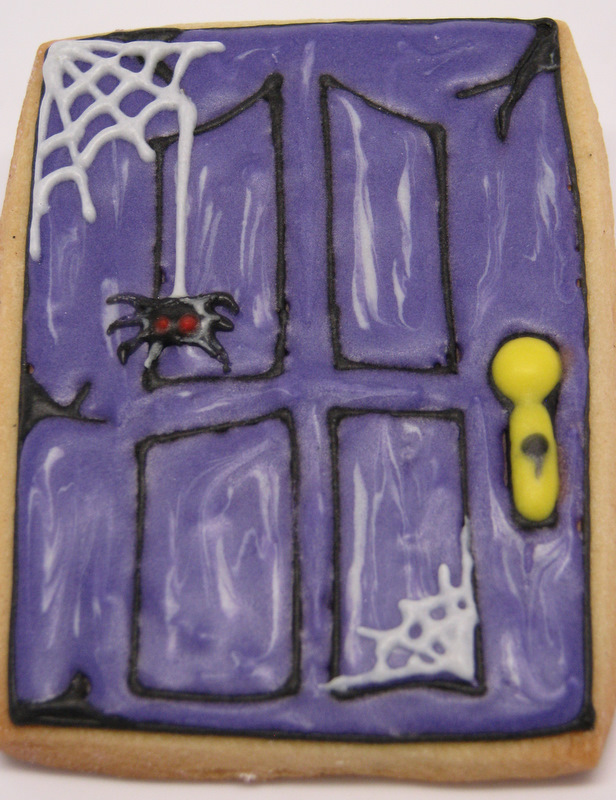 How about just a haunted door? Does it work? I don’t know. I’m not sure I’ll do it again, but it was worth a shot. 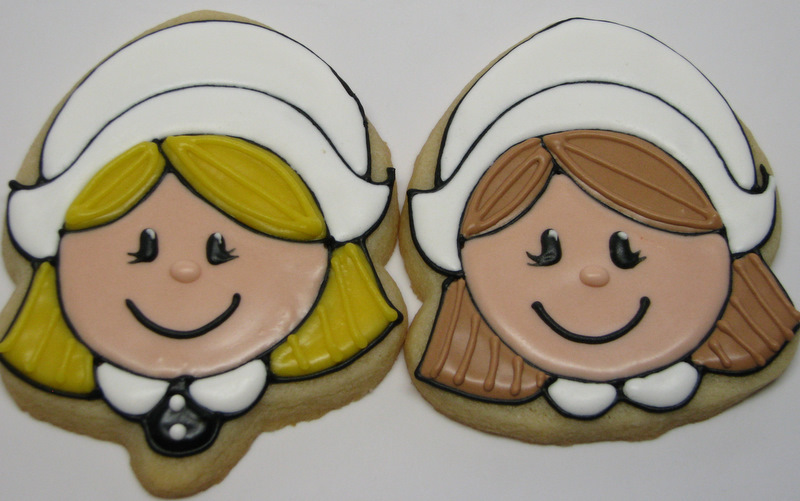 I recently got to see a Cookie Artisan (Maryann) platter of cookies in real life. They were amazing. 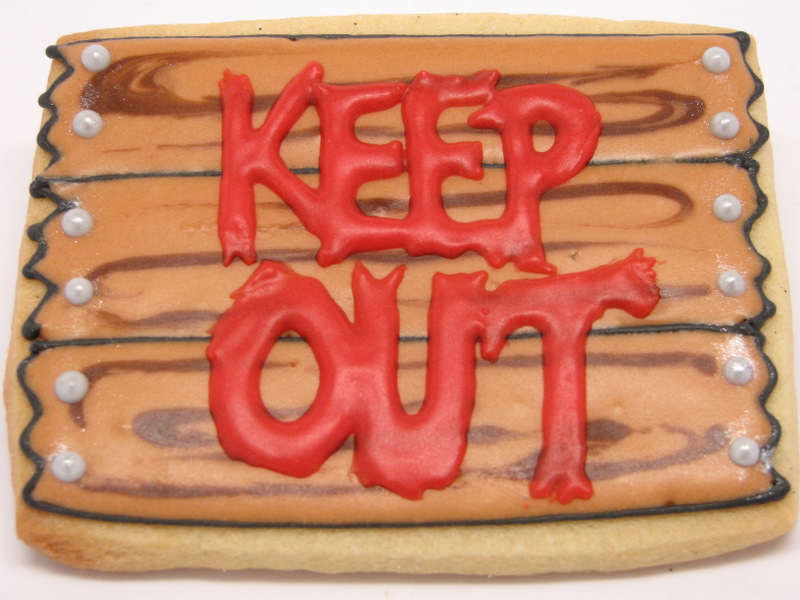 I loved her sign, and so I got the idea to do a scary “KEEP OUT!” sign. I tried to make the lettering look rough and scary. I piped it on and then scraped at the edges a little with my boo-boo stick. I think next time I could do it better. But not bad for a first shot. This next one is a simple idea that wasn’t executed as well as I’d hoped, but again, it has potential. I think that’s what I’m learning about “thinking outside the box”– sometimes you have to try it a few times to make it work, but you know if you’re on the right track. Next time I’ll do the background a different color. But it’s cute in its own way. I really liked this next one. It was fun to do, super simple, and it turned out cute. I know what you’re thinking. That this isn’t a true rectangle. Which is true. But all I did was trim the tiniest bits of the top left and bottom right corners off before baking so that the bag would have some dimension. Easy easy easy. I thought it needed some depth, so I painted on some charcoal black petal dust in the corners where the bag would be folding inward. 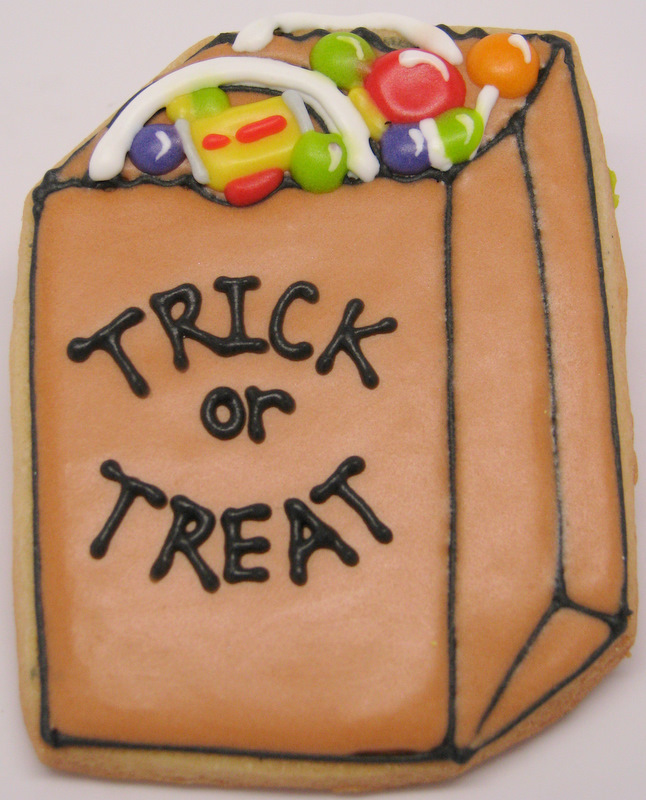 Just like the fun size candy bars earlier, I went super simple with the candy in the bag. You just want the overall look to be there. 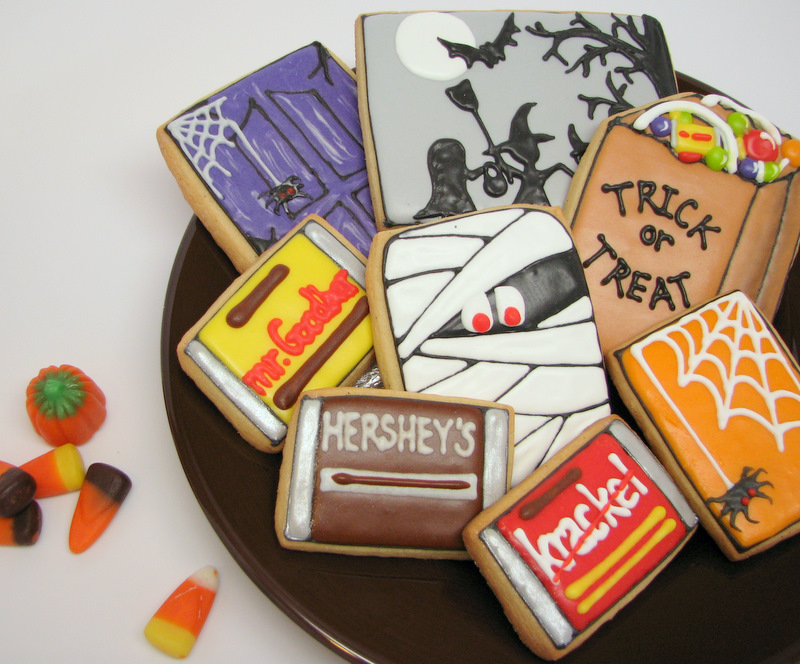 So those are my thinking outside-yet-inside-the-box cookies. And I tried some Glorious Treats tricks for photographing my cookies. You know, like actually putting them on a plate and stuff. 😀 I hope she’ll be proud of my attempts at taking some prettier photos. Look Glory! Props! 😀 I’ll get the hang of this yet. I came away from this little exercise realizing the the possibilities for the Rectangle Set of cookie cutters is seriously endless. What would YOU do with them? Comment on this post by Thursday October 13th at midnight (wherever you are!) and I’ll enter you to win a set all your own. Please enter only once. I’ll choose THREE winners using Random.org. Another fun (similar, yet different) project coming up soon! 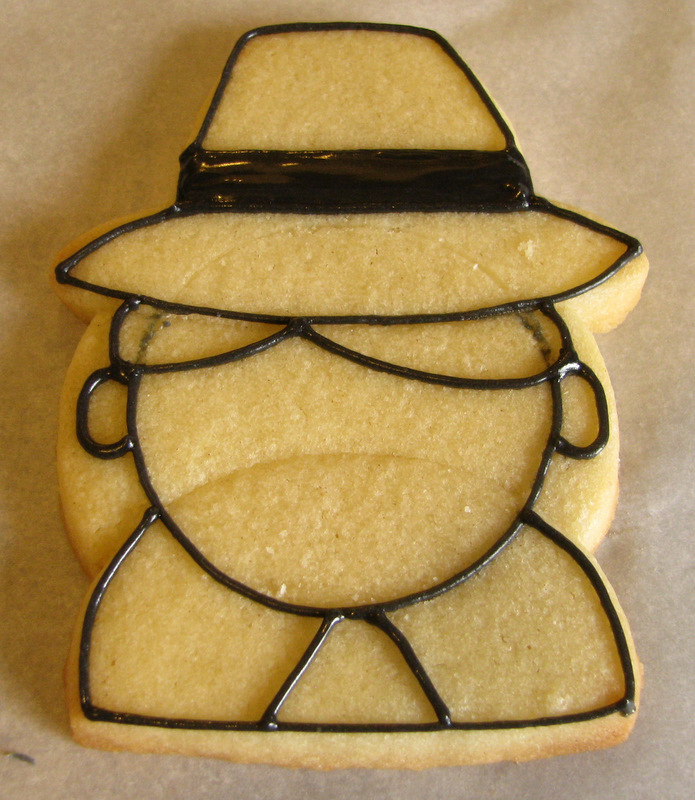 Off to Cookie Camp! But before I go…. 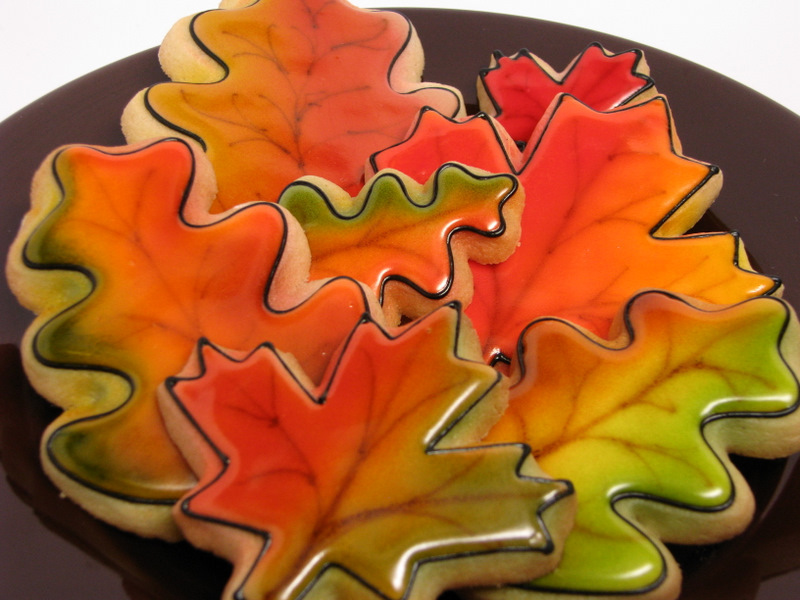 I told you when I came back after my summer hiatus that I wanted to fill the blog up with fall cookies… and so far I haven’t delivered. Until now! 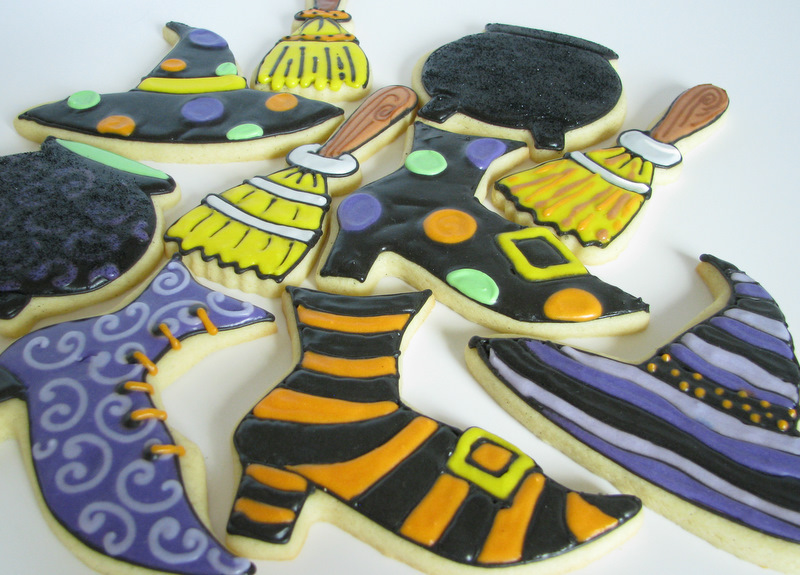 One of my favorite new Wilton sets is this cute Witch-Themed Cookie Cutter Set. I love the boot, especially. I think it could pass for a Victorian boot, which I’ve tried to do before by hand cutting around a stencil. I was going to try one and show it to you, but my 3-year-old ate it. I’ll still try it sometime. I wish I could say it was my 3-year-old that stuck her finger in that swirly purple boot. It was me. I do that a lot. Meringue Powder Buttercream is really pretty sturdy, but if you nick it in the first couple of hours, it’ll leave a mark. As demonstrated. 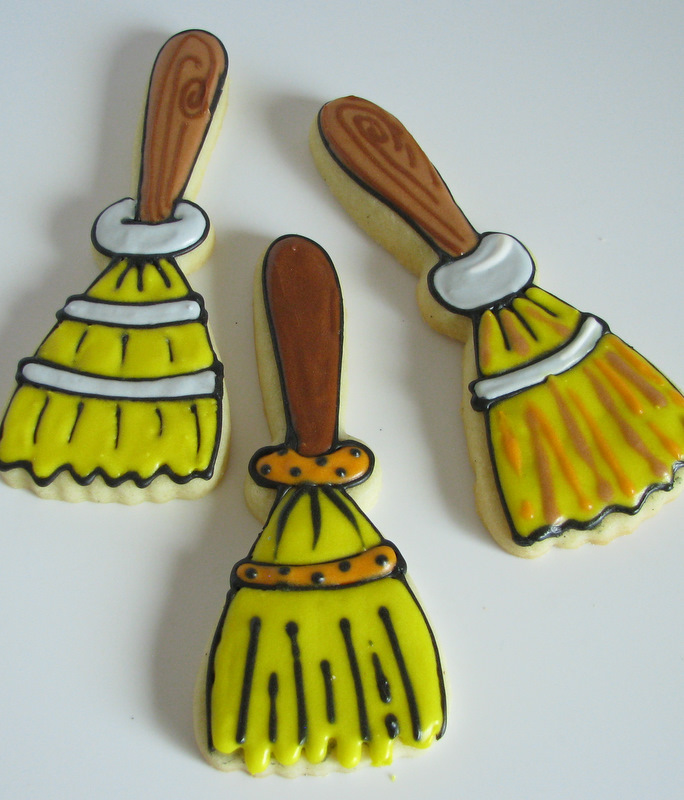 The brooms made me chuckle. 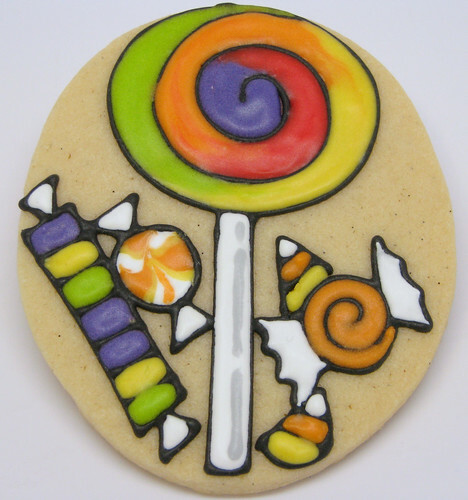 I try not to look at examples of decorated cookies when I’m thinking up my own designs– I don’t want to be influenced by other cookies. 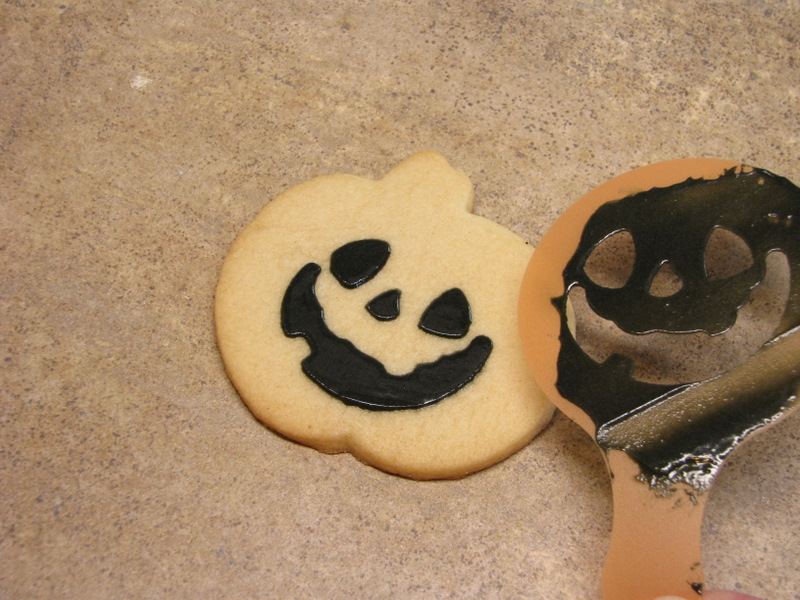 So I didn’t look at the example pics that came with these cutters before I started decorating. When I got to the brooms, I was like “What in the heck kind of design is this?” I could NOT figure out why it had such a large ring-thingy between the handle and the main part of the broom. I did the best I could, and after I was done, I went and looked at the packaging. Hmm. I guess I’ll know for next time. 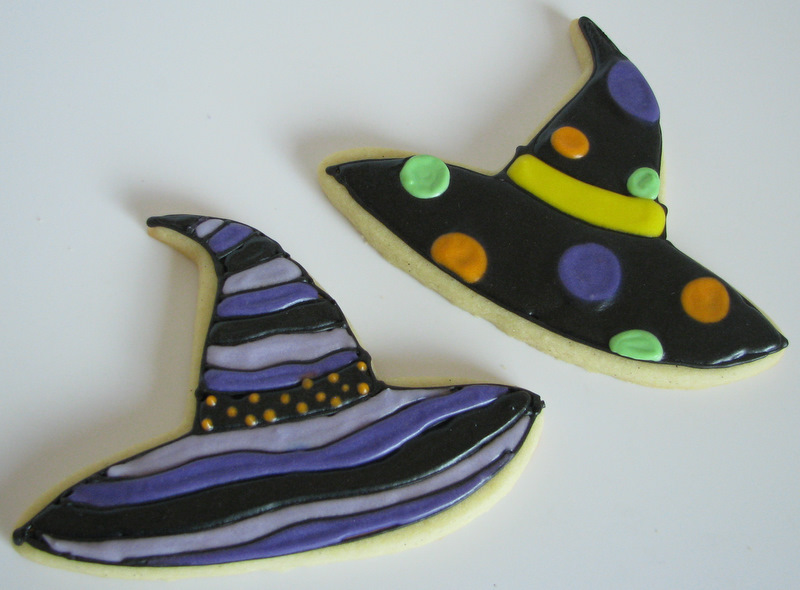 There’s also a cute witch’s hat. (Insert apology for bad photography here). 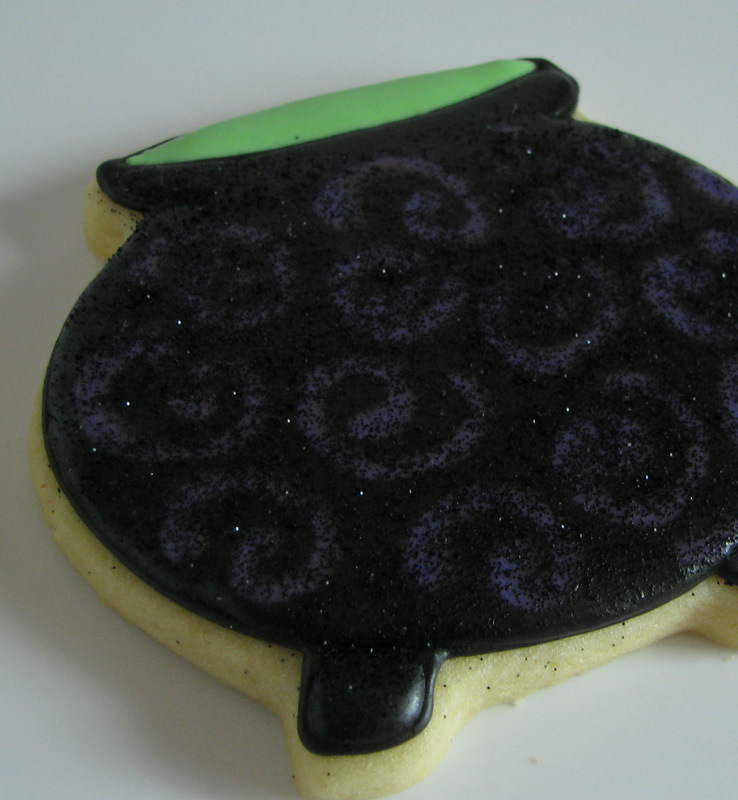 I’m hoping the cookie ladies at cookie camp can help me with photography. I need it! I was really lacking in the creativity department when I did these, and it shows. Sometimes cauldrons are uninspiring for me. The one on the right was a bad idea that seemed good at the time. I wondered if I made purple swirls in the black, and then sprinkled the whole thing with black disco dust, if the purple would be very subtle and look cool. Not really. Just made it look blotchy. But that’s ok. I like to show you the failures as well as the successes because if I only showed you the successes, it would be a pretty short blog. Ha ha… oh, and also because I don’t want you to make the same mistakes. Let’s just go with that one. I’m going to give a set to three of you. Just comment on this blog and you’ll be entered. I’ll go ahead and run it till I’m back from Cookie Camp– comment by midnight Sunday October 2nd. I’ll use our friend Random.org to choose 3 of you at random to win. Please enter only once. Good luck!